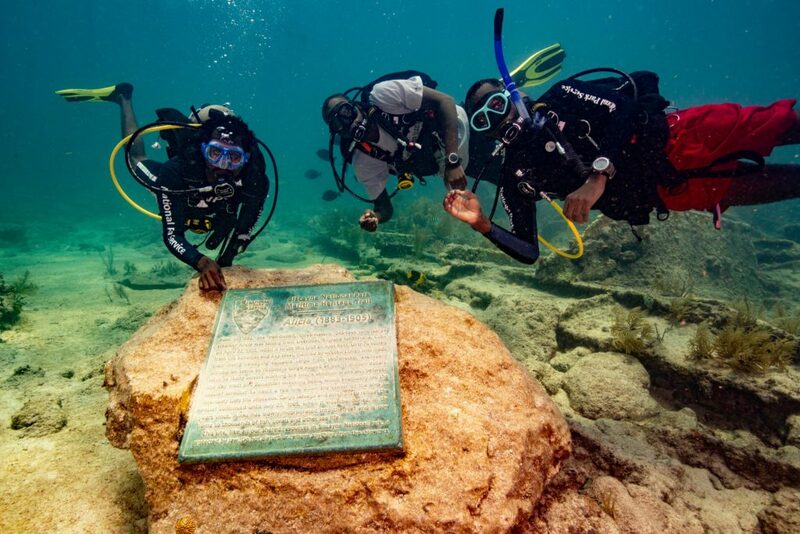 In the early 1950s, developers and conservationists fought over the future of the northernmost keys of Florida. Located by Biscayne Bay, developers envisioned building hotels, roads, and a large industrial seaport to support the growing population. 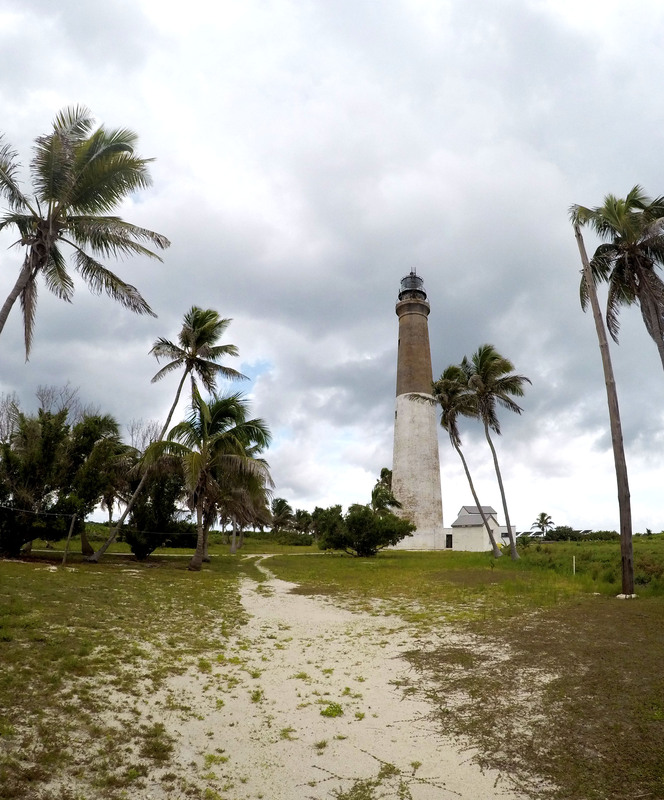 The battle between the two groups raged on for many years, until 1968, when Biscayne National Monument was created. 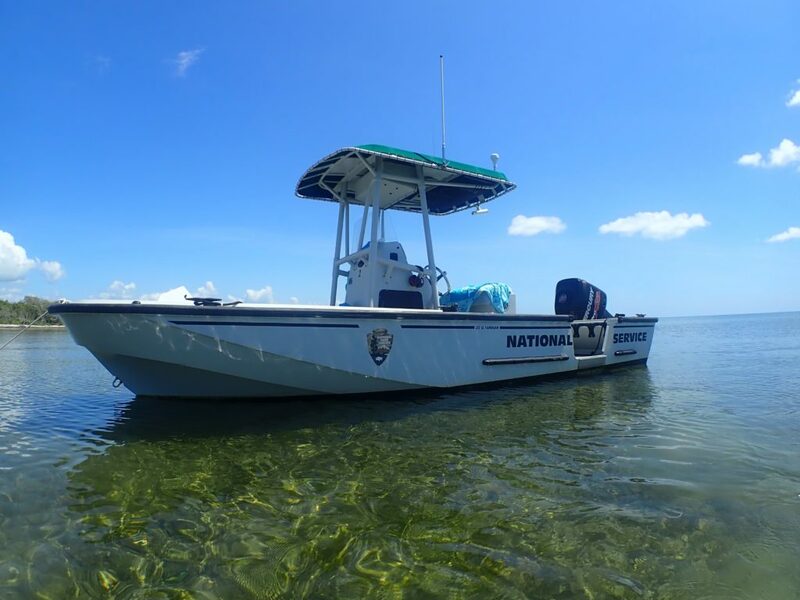 Expanded and re-designated as Biscayne National Park (BISC) in 1980, the park protects the ecological and historical resources found in Florida’s northern keys. 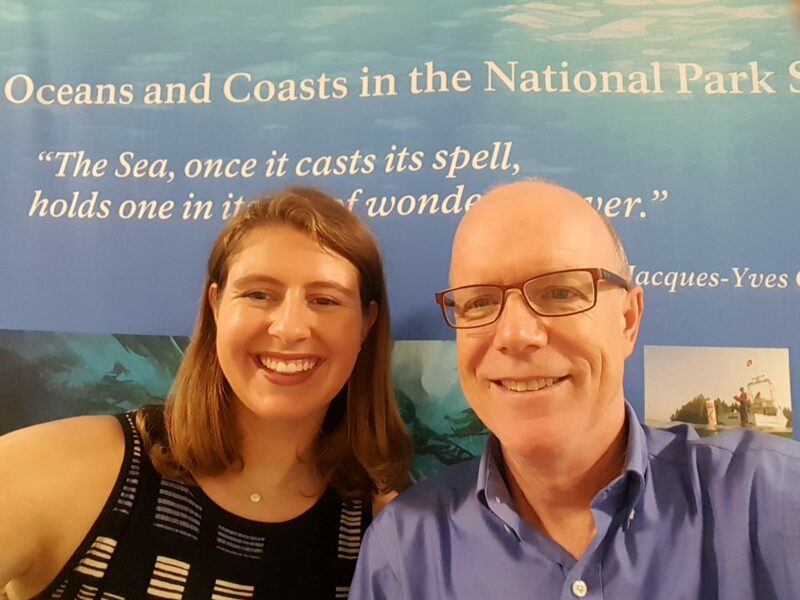 Upon arriving in Miami, Shelby Moneysmith, the Regional Dive Officer and a biologist at BISC, picked me up at the airport alongside Herve, her husband who works for the University of Miami in coordination with BISC. After a filling lunch, I unpacked at park housing and accompanied Shelby and Herve for a quick stop at a popular fruit stand (Robert is Here). The once small, fruit stand started in 1959 but has since grown into a huge operation which sells a wide variety of fruit and delicious milkshakes. My mango milkshake was especially delicious! That evening, I met my roommate for the next two weeks. 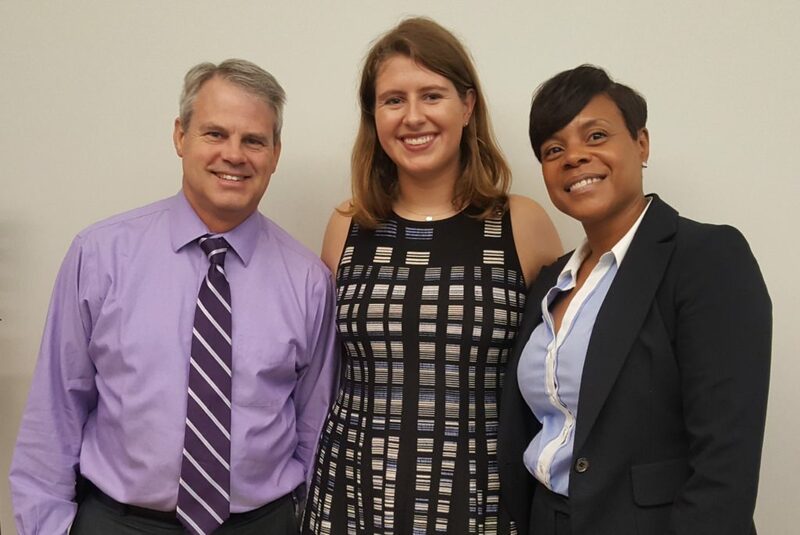 Originally from North Carolina, Devon received an internship to work with the interpretation department through the Historically Black Colleges and Universities Initiative. On Monday (Memorial Day), Devon and I took the free day to explore the grounds and the visitors center. 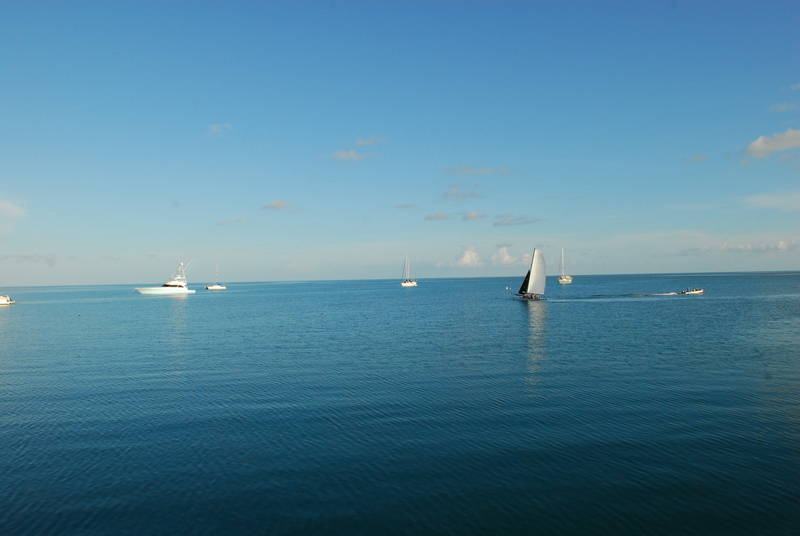 While Biscayne National Park is approximately 180,000 acres, 95% of the park is water. Due to weather, my dives on Tuesday and Wednesday were canceled. 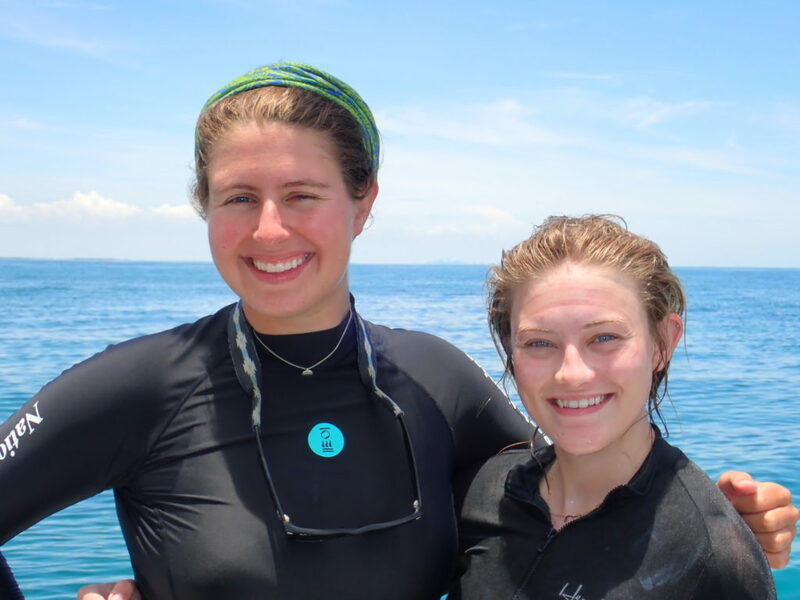 However, luckily on Wednesday, I was able to accompany Shelby and Elissa Condoleezza-Rice, a biological science technician, on one of their turtle nest monitoring trip. 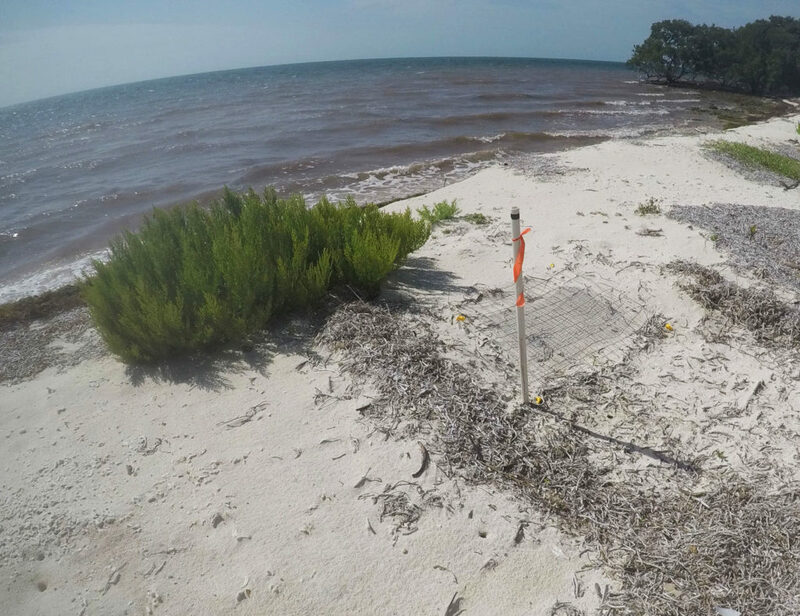 Every few days, six beaches along Biscayne’s keys are checked for loggerhead turtle activity. Loggerhead turtles reproduce every 2-4 years but often nest multiple times throughout the season (May-October). As an endangered species, the greatest threat to loggerhead sea turtles is the loss of habitat due to coastal development, predation, and human disturbance. 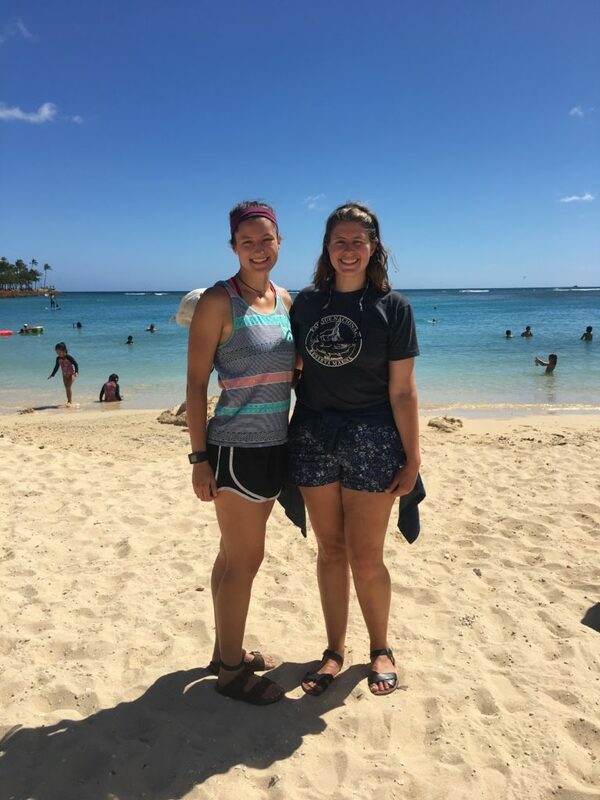 After wading to shore at a few beaches and observing no activity, Shelby and Elissa found evidence of a false crawl on our fourth beach. When a female turtle crawls onto the beach to explore a nesting area but in the end decides to move on, this is characterized as a false crawl. At each false crawl, the surveyors marked the site, record location/site characteristics, and any additional metadata. This information prevents the surveyors from recounting the activity, and in case the false crawl ends up being a misidentified nest, they have the location for future monitoring. Within a few more minutes, Shelby, Elissa, and I stumbled upon our first turtle nest. Compared to a false crawl, a nest was distinguishable because a patch of sand/vegetation was clearly disturbed as the loggerhead dug a chamber to store her clutch. At each nest site, we gently dug about an elbow deep into the sand to locate the clutch. Little contact was made with the eggs to limit the introduction of bacteria. To protect the nest, a screen was placed above the nest to protect the chamber from predation. On Thursday, I finally participate in the diving operations at BISC. 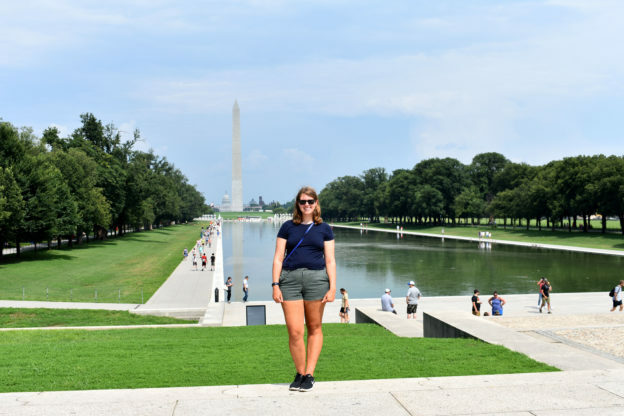 For two days, Arlice Marionneaux, an American Conservation Experience intern at BISC, and I planned on surveying several archaeology sites within the park’s borders. 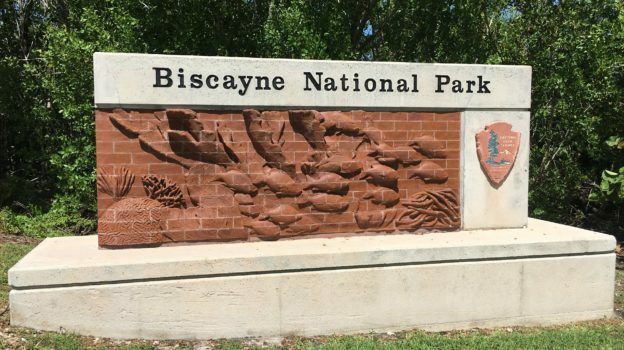 Checked every ~5 years for damage and looting, Biscayne National Park has over 120 archaeological sites. 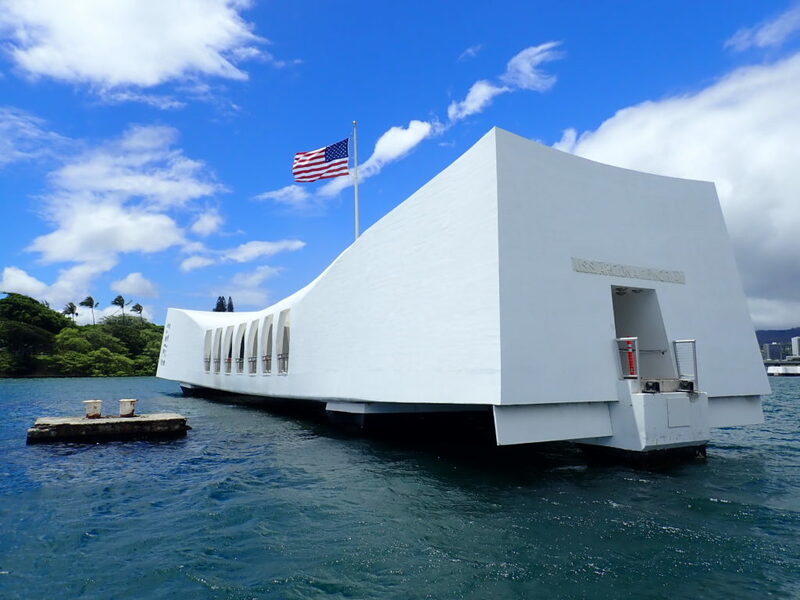 Most of these sites are known only by GPS coordinates. 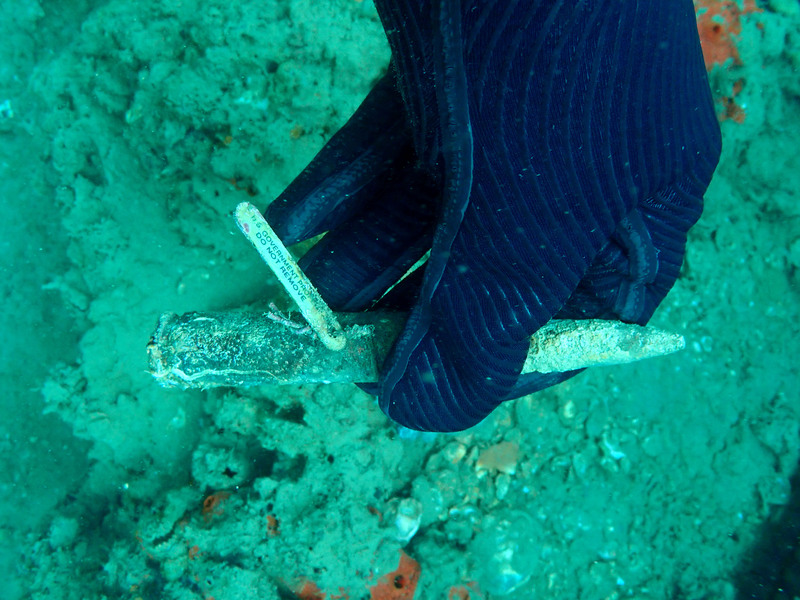 At each site, we used a map to locate pre-recorded wreck fragments including wood decking and ballast piles. Several sites had been damaged by Hurricane Irma, and on a few occasions, we were unable to find the marked artifacts. Thursday was also filled with a multitude of boat problems. From radio issues to boat battery problems, our engine stopped working on a few occasions and forced us to throw anchor in a channel to prevent running aground. While stressful at the time, I learned a lot about boats and troubleshooting from Arlice. On Friday, with a different boat, we headed out to finish several more archaeological sites. 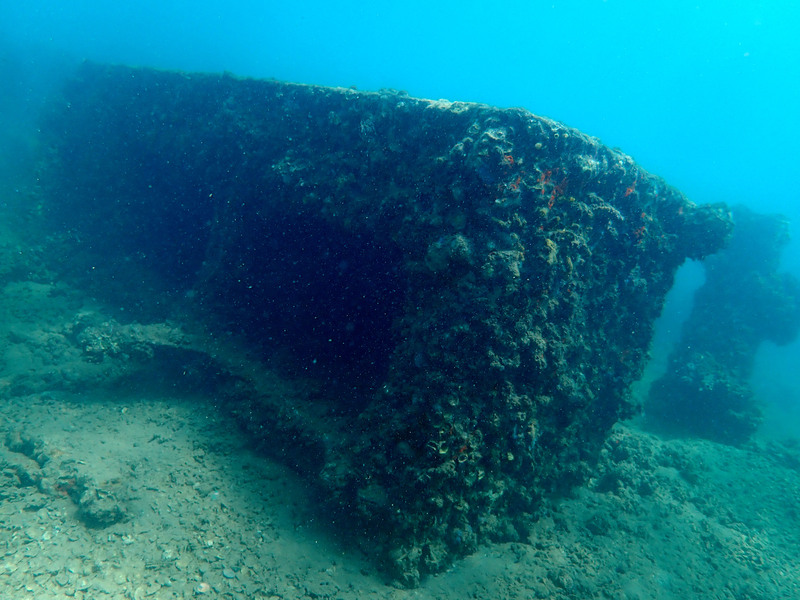 On our second of the four dives, Arlice and I visited the Lugano. 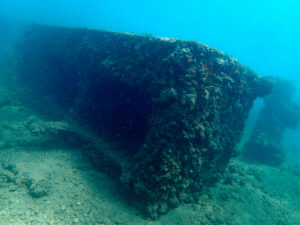 Sunk on March 9, 1913, this British steamer was heading to Cuba with general cargo and 116 passengers when it grounded on Long Reef during high winds. 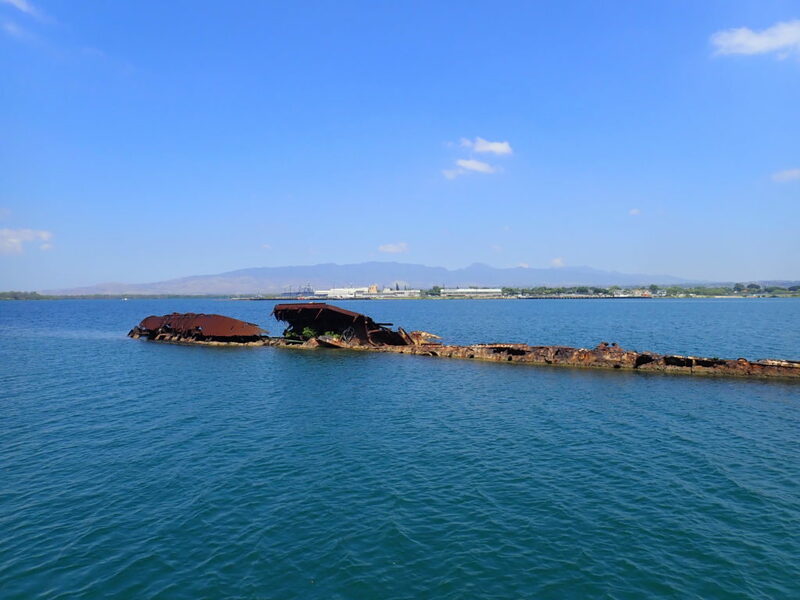 Unlike the previous sites, the Lugano is a more exposed wreck site. 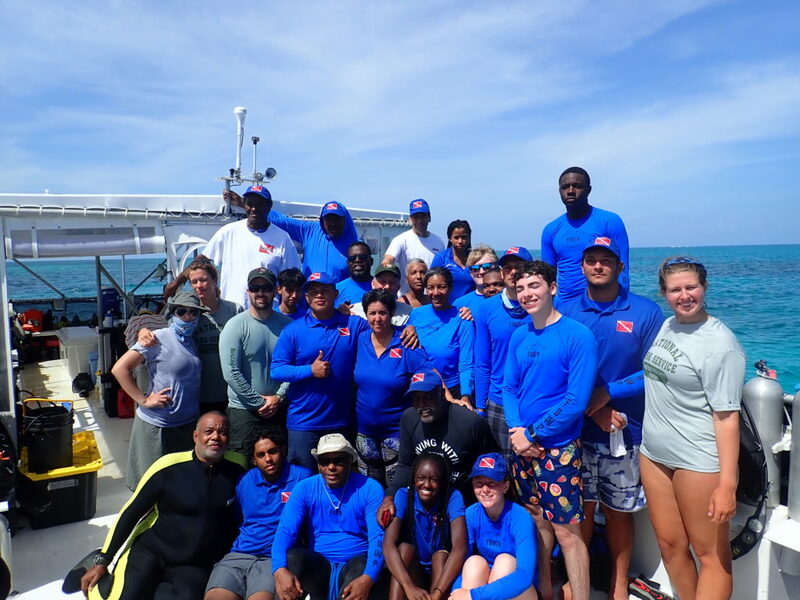 While surveying the area, we observed a large diversity of reef fish, a nurse shark, and removed several fishing lines wrapped around gorgonians. 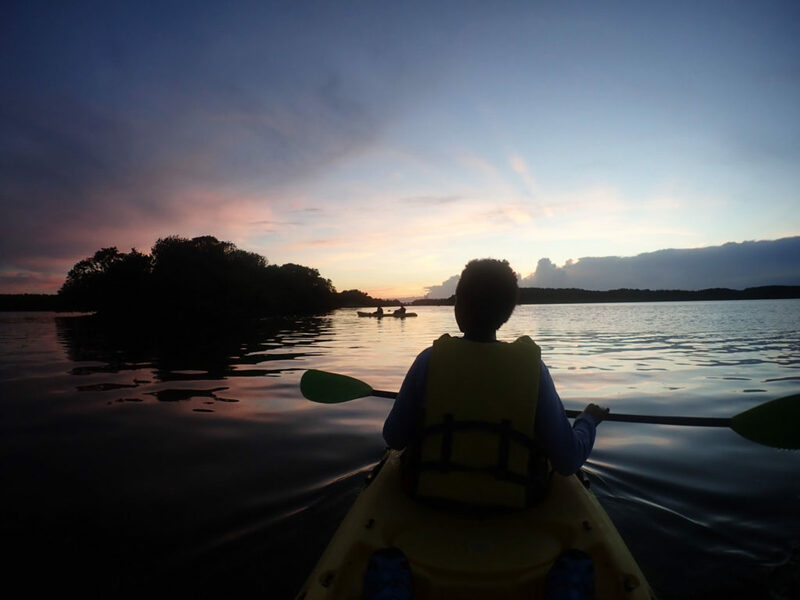 That evening, Dennis Maxwell, a park ranger at BISC, was kind enough to bring Devon and me on an evening kayak trip through the mangroves. With the visitors center in the background, Devon and I took off on the crystal clear water as the sun set over BISC. As we rounded the corner of a mangrove, we observed brown pelicans dive-bombing mullets riddling the shallow waters. To evade the pelicans, mullets jump out of the water. From our fluorescent orange kayak, the show as pretty spectacular. Saturday morning began with a knock on my door. Terry Helmers, a volunteer at BISC for 31 years, asked whether I wanted to spend the day assisting with mooring buoys. With no weekend plans, I immediately jumped at the opportunity. 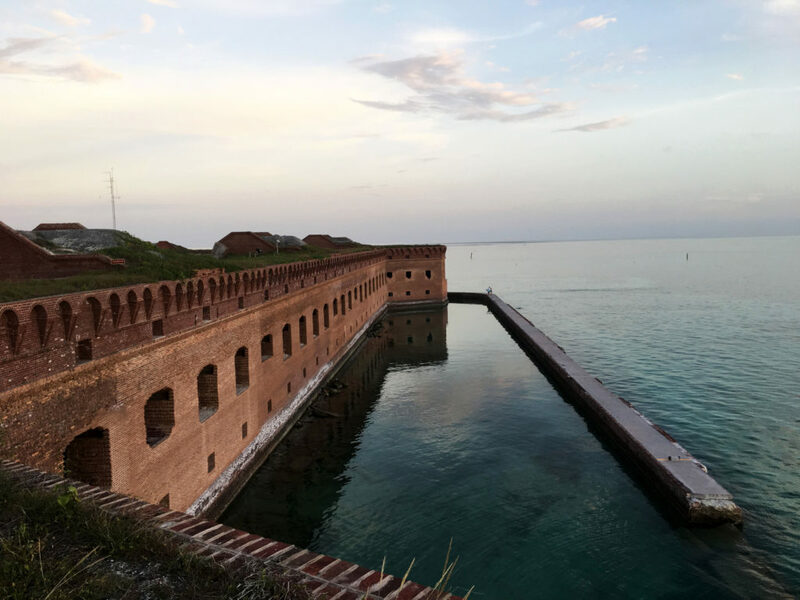 Throughout BISC, there are 40+ mooring buoys along the heritage trail and various other locations to allow visitors to easily explore their park without damaging the marine habitat below. Replaced every year, these buoys can get damaged by hurricanes or boat engines. 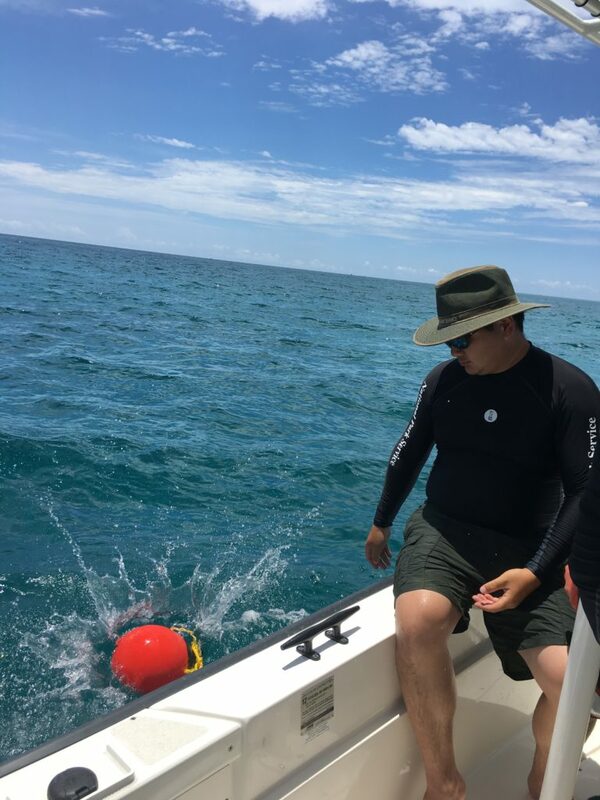 Mostly by freediving to 10-30 ft, Terry and Ana Zangroniz, another volunteer, spend several weekends at the beginning of the summer season replacing the buoys. 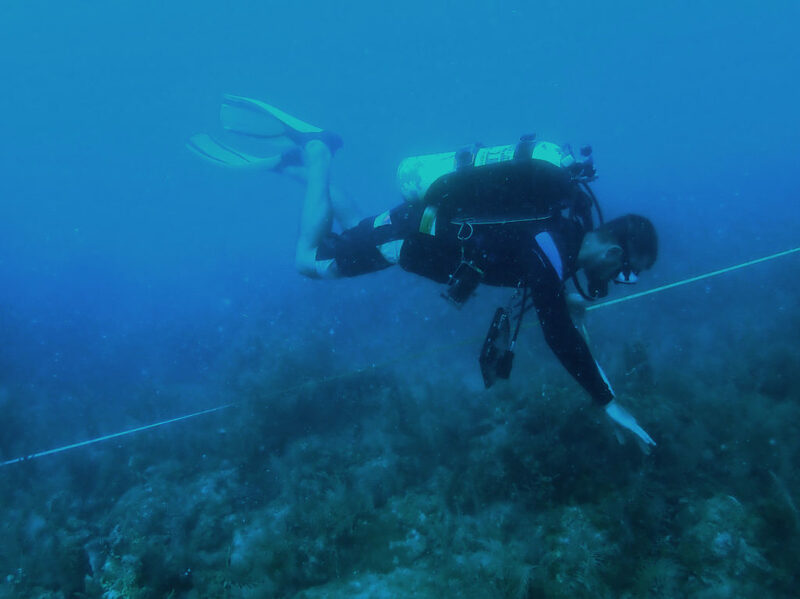 While I had experience freediving for fun, I struggled to stay down for extended periods of time while also expending energy to unscrew bolts and remove caked on organisms. Terry, on the other hand, could unattached a buoy and bring it the surface in one breath. It was beyond impressive! In addition to replacing buoys at six sites, Ana and Terry let me snorkel the Mandalay. 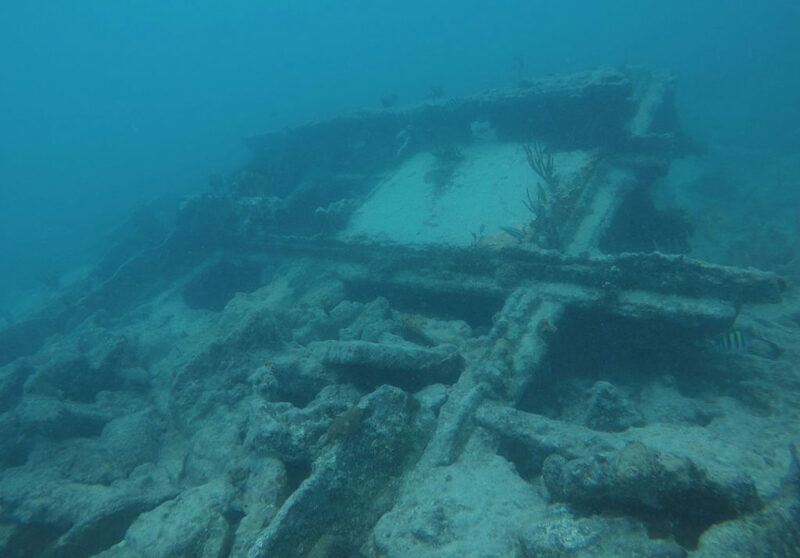 Sunk in 1966, this luxury-line from the Bahamas to Miami hit a shallow reef. All 35 passengers were rescued and scavengers later stripped the vessel. 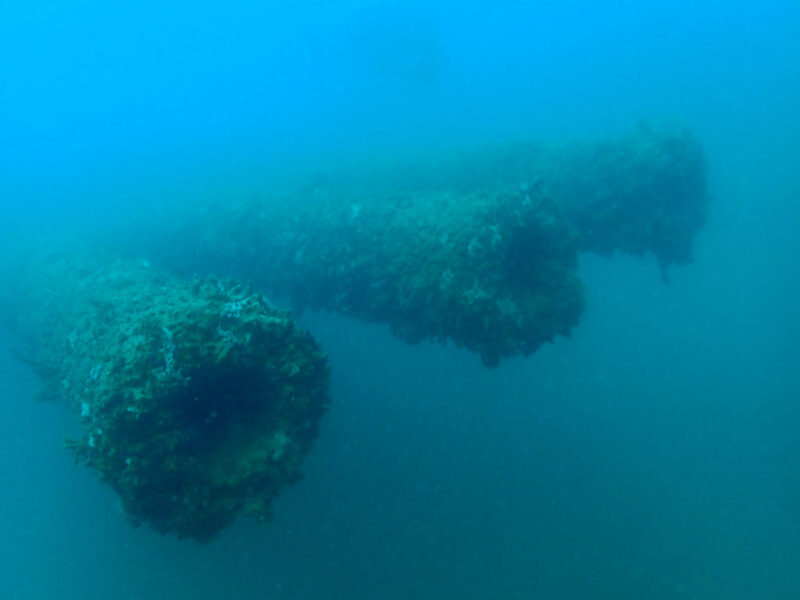 Sitting in shallow, clear water this well-persevered wreck is teeming with fish life. 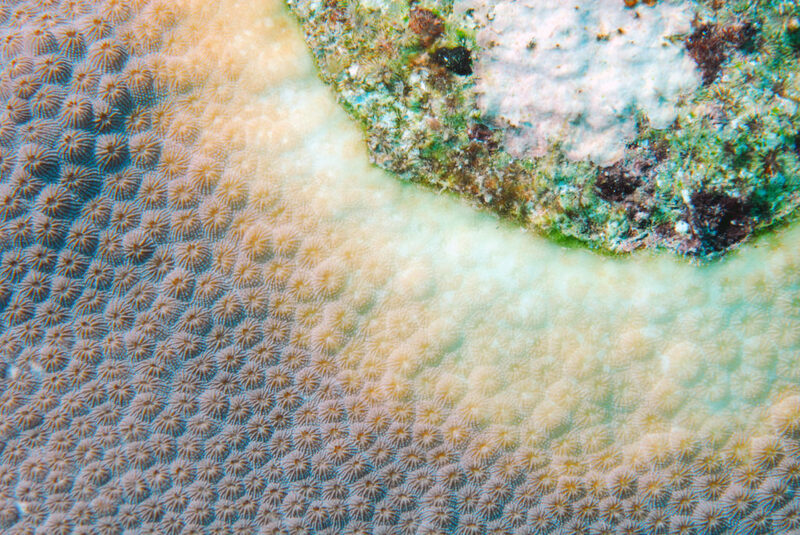 At the surface, hundreds of chubs surrounded you as you explored every small crevice of the vessel. 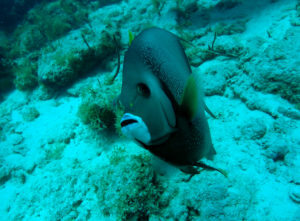 In addition, I saw a midnight parrotfish. While relatively common in Biscayne National Park, when in Bonaire, I was the only member of my marine station to not see a midnight parrotfish after living there for seven months. Finally, after traversing the dang Atlantic, I could finally check a midnight off my list! 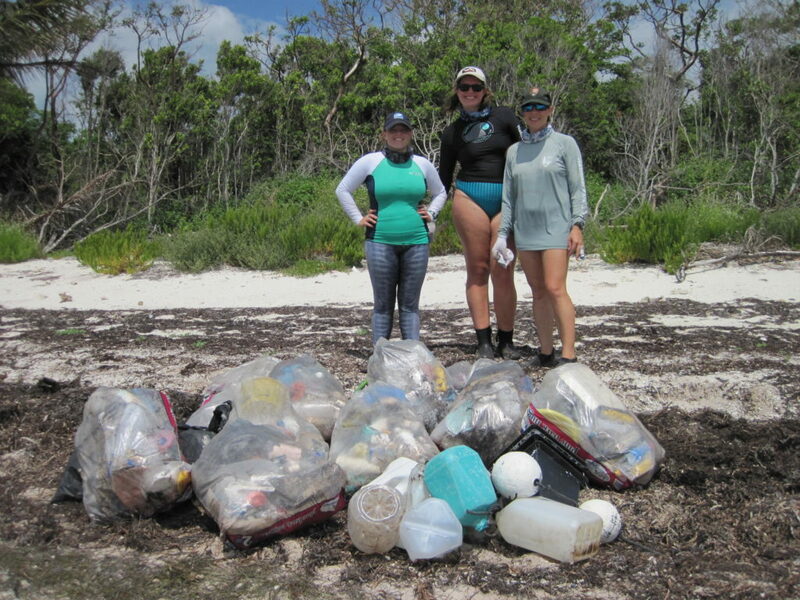 Unintentionally, we also collected a large amount of marine debris while out for the day. 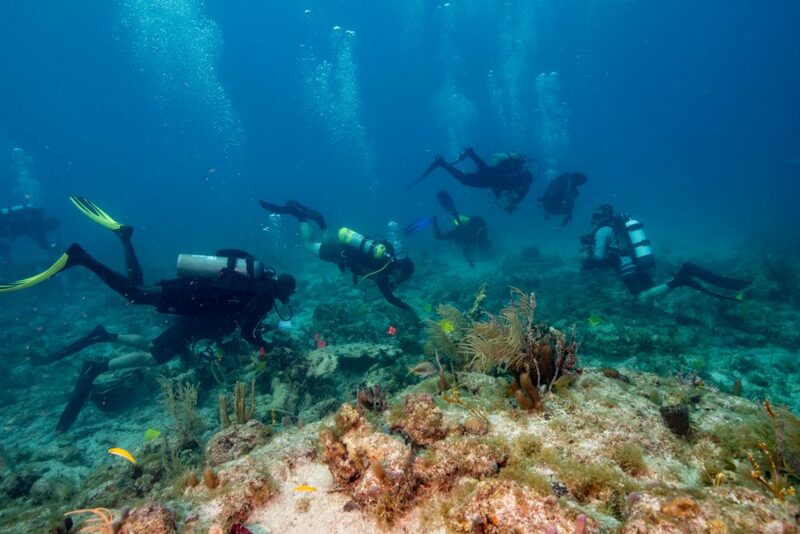 With limited fishing regulations and a crowded metropolitan city nearby, Biscayne has a sizable amount of marine debris. From plastic bags floating along the surface to abandoned crab traps scattered on the bottom, Terry, Ana, and I collected what we could. 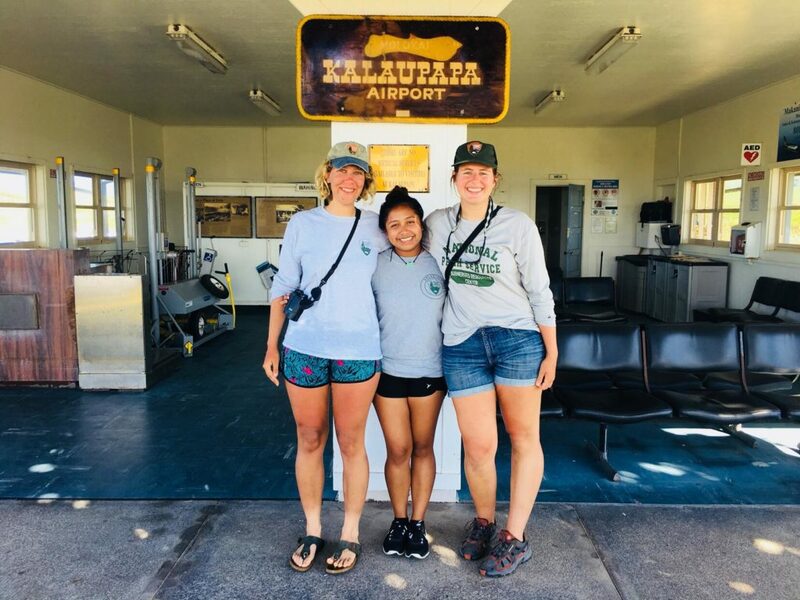 Following a relaxing Sunday, I traveled out again with Elissa and Hayley Kilgour, an NPS intern, to check for turtle nests on Monday. After observing Shelby and Elissa the previous week, I was excited to correctly identify two nests myself during the day trip. 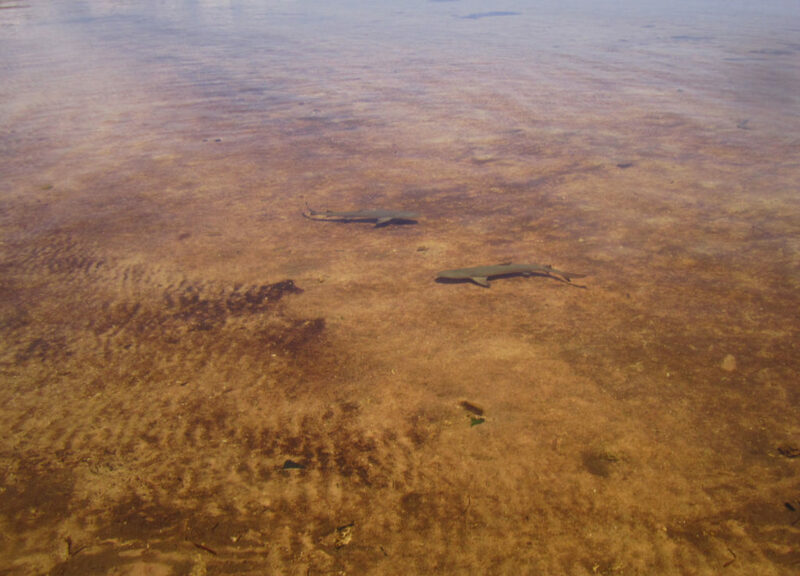 While returning to the boat, we also saw five juvenile blacktip reef sharks swimming through the shallows. 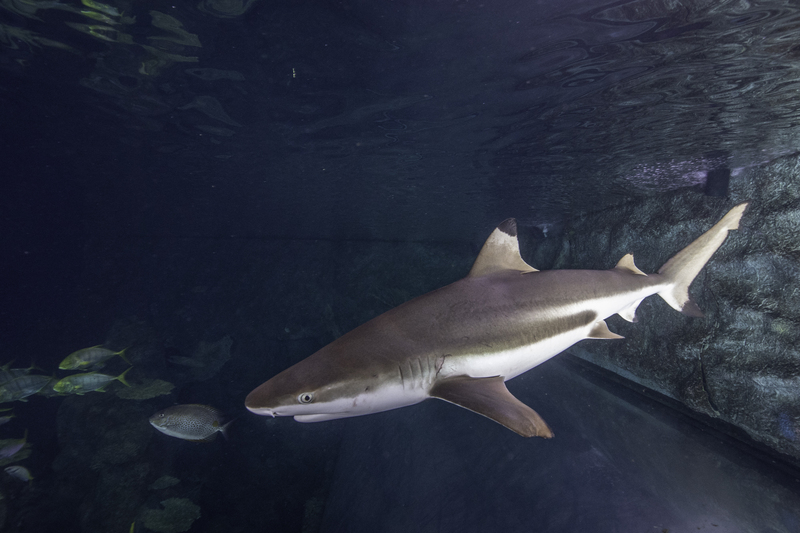 In the shallows, we commonly saw stingrays or tiny fish but sharks were definitely a treat. 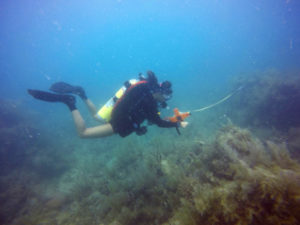 On Tuesday, I assisted with the ongoing marine debris study. 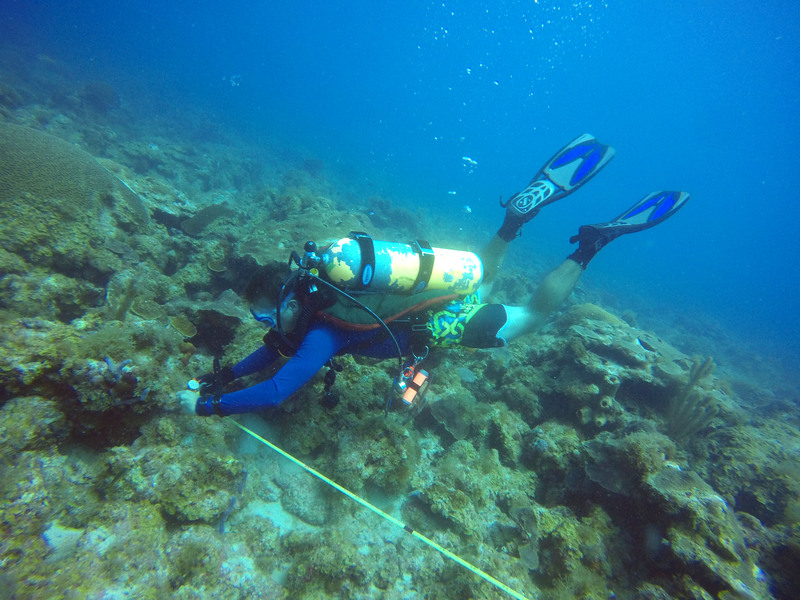 Previously, transect markers/floats were placed at 12 sites through the park for a lionfish removal study. 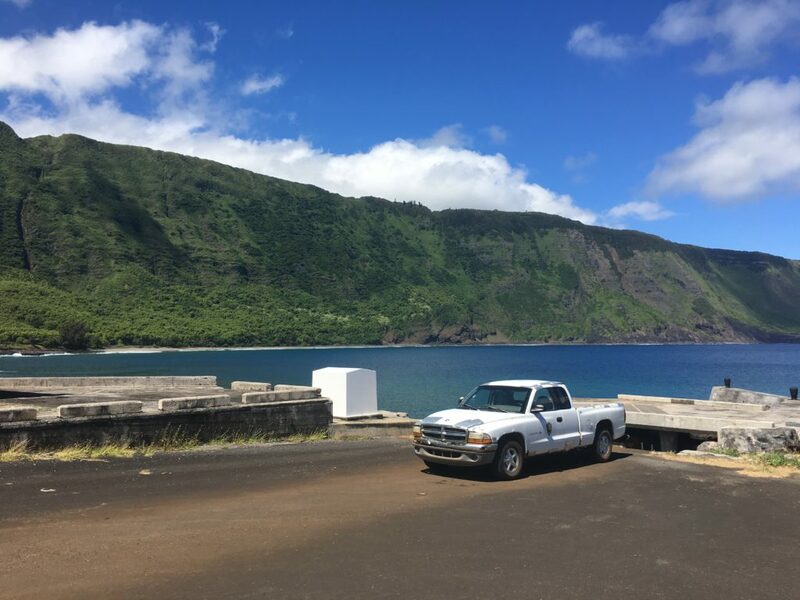 After the study was complete, the natural resources department decided to use these sites to study the accumulation of marine debris. Marine debris is collected from each site once a year and the amount/type is recorded to estimate the overall accumulation. Every 6 months, markers are cleaned and damaged floats are replaced. 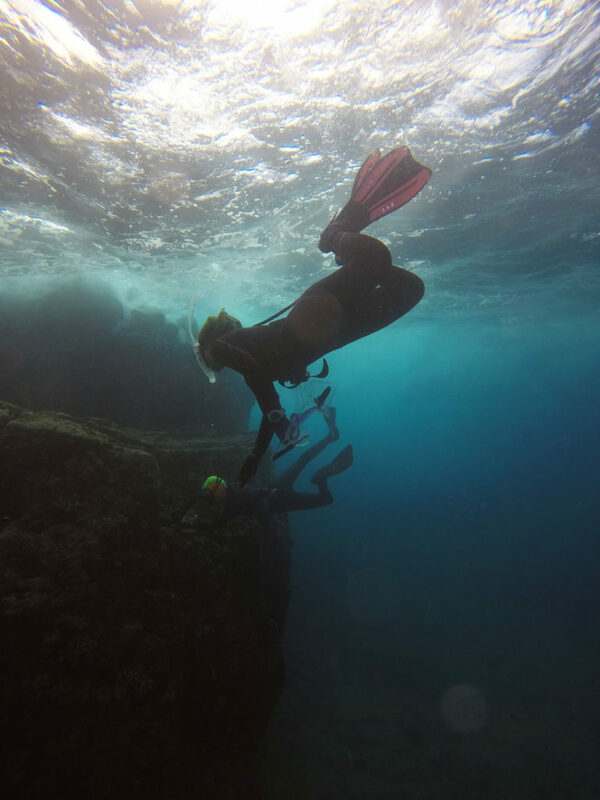 While diving with Vanessa McDonough, a biologist at BISC, we were met with strong currents and a float bag that decided to prematurely travel to the surface. 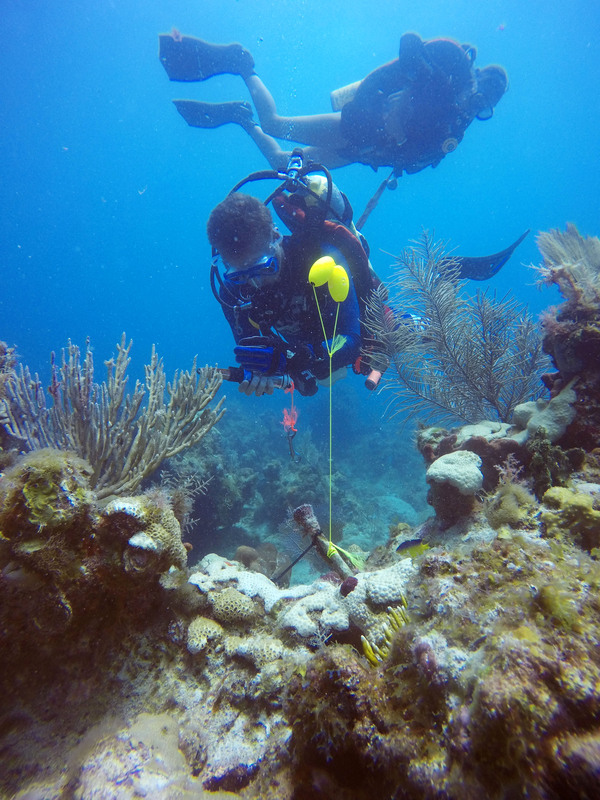 Fortunately, we managed to check the markers and to spear a few lionfish along the way. Lionfish are carnivorous fish native to the Indo-Pacific. These beautiful fish were popular ornamental fish which were either intentionally released in the Atlantic and accidentally released due to storms. In the Atlantic, lionfish have no known predators, reproduce year-round, and compete with native fish for food and space. 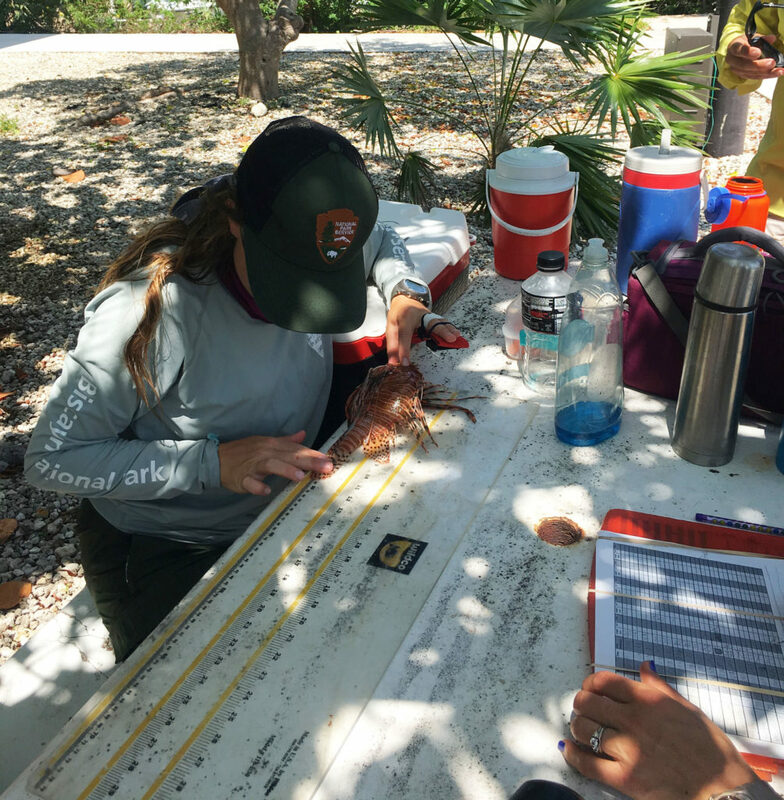 At BISC, biologists spear lionfish in hopes of reducing their numbers at the park. At the end of our day, we measured the total length of each lionfish and stored them in the fridge for future interpretation programs. After an eventful day in the field, I was starving. Jay Johnston, BISC’s education program coordinator, was kind enough to invite me and several other employees and interns to his house for Taco Night. Our evening was filled with chips and salsa, scrumptious tacos, and great conversation. 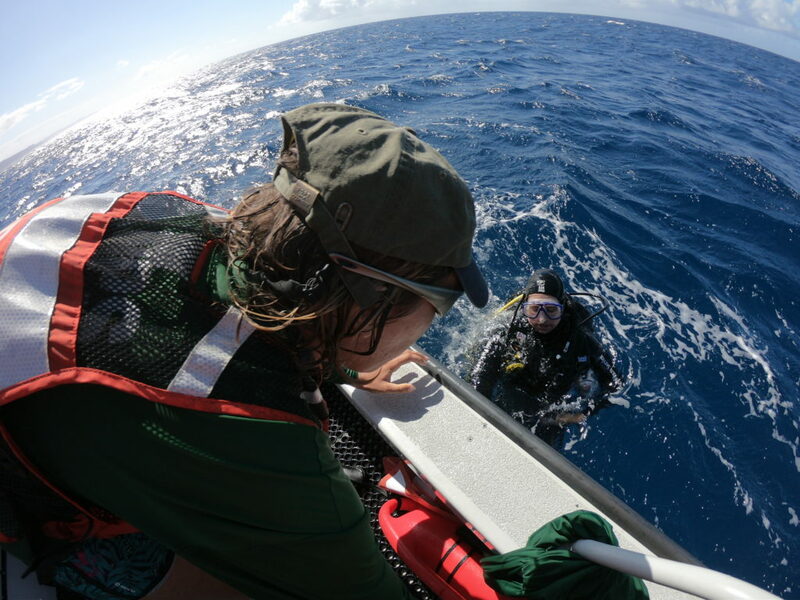 With Amanda Bourque, an ecologist for BISC, as my dive buddy, we completed two more marine debris site dives on Wednesday. 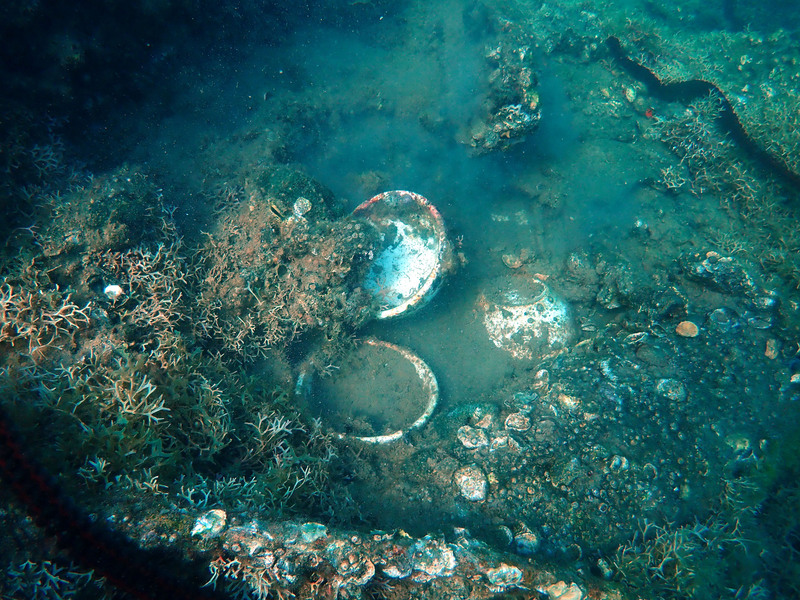 Since these sites are apart of an ongoing study, we were not allowed to pick up any debris within the transect. Already within six months, these sites were covered in stray lines and crab traps that were hard to resist collecting. 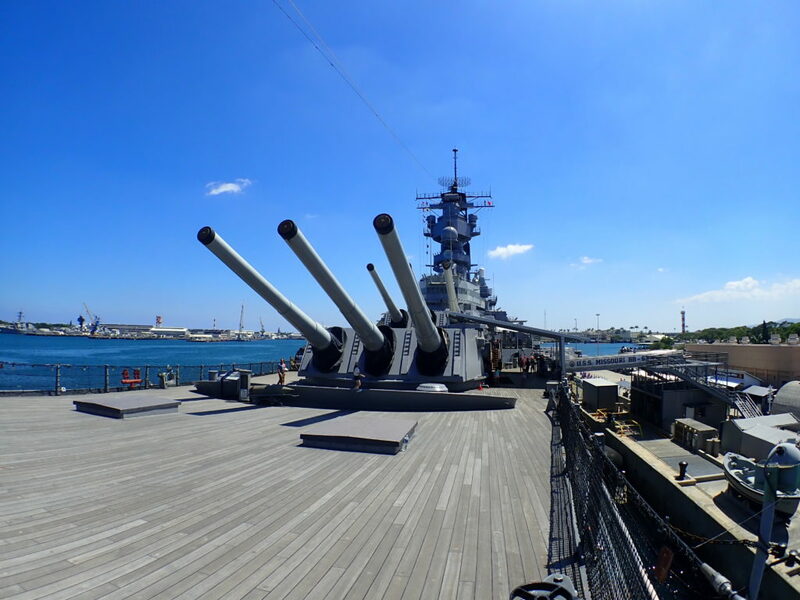 Blue skies and calm waters….ready to dive! 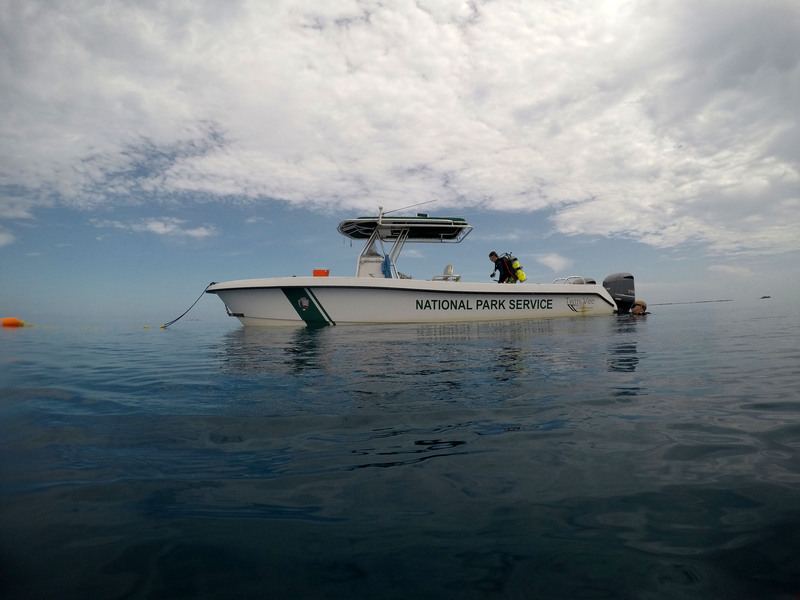 Thursday was spent assisting with goliath grouper survey dives. 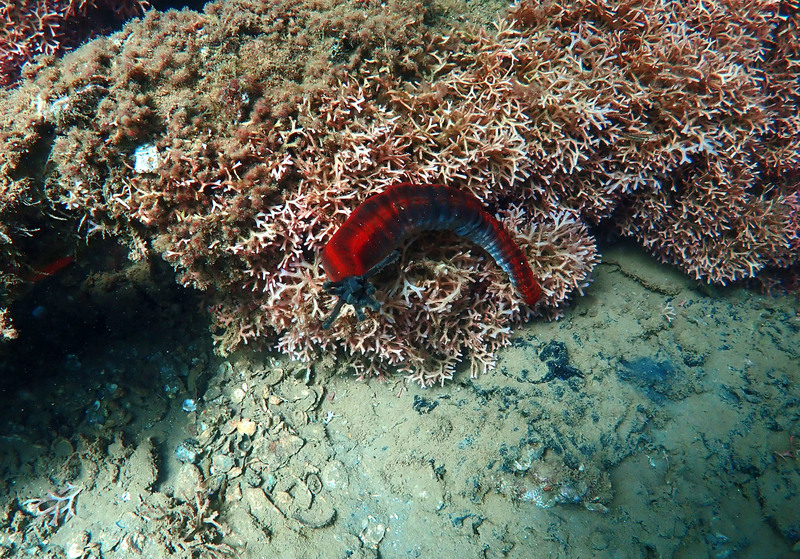 Relatively uncommon within BISC, at previously chosen locations, 20 min roving diver surveys are used to search for this critically endangered species. Unfortunately, during our four dives, a Goliath was not observed. 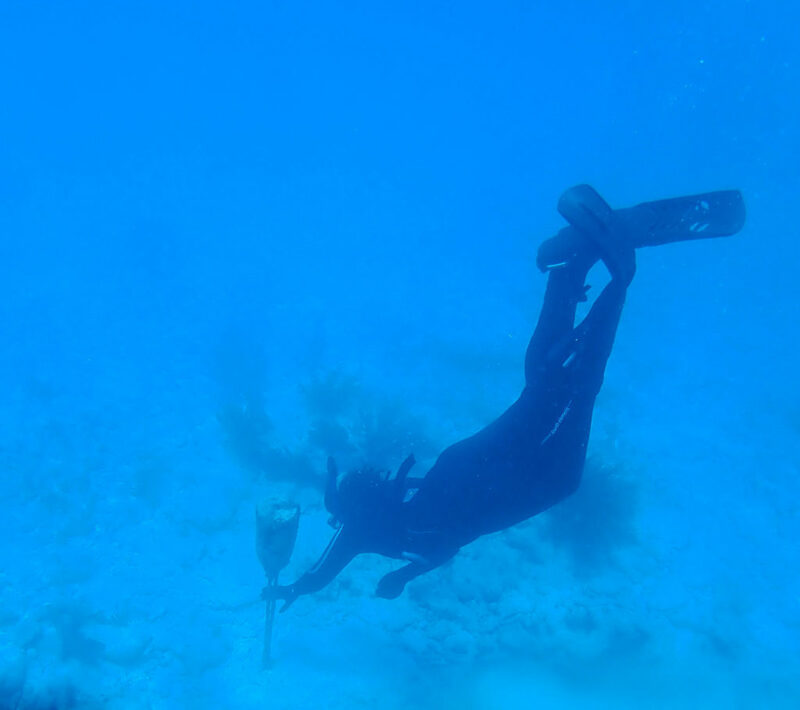 We did, however, manage to spear a bunch of lionfish even one that decided to hid under Elissa’s legs mid-capture. 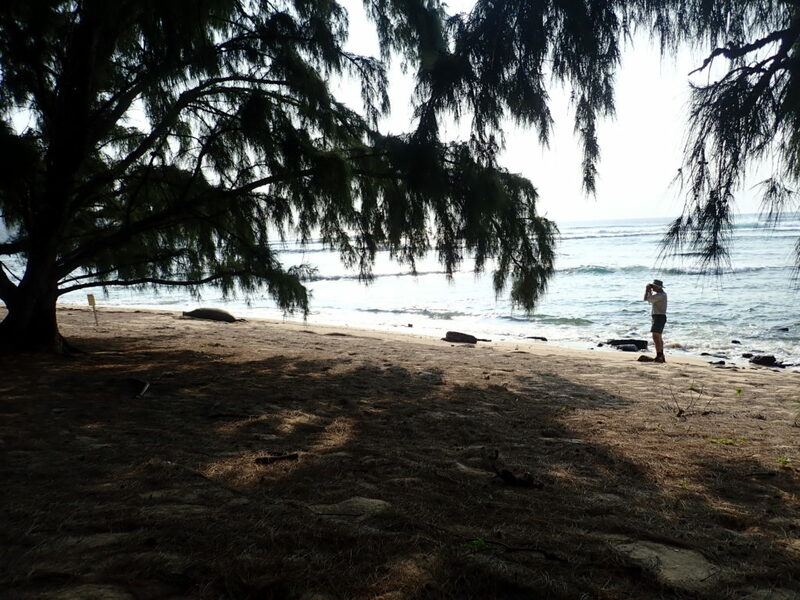 My final day was spent monitoring the turtle nesting beaches. With no new nests, Elissa, Hayley, Suzy Pappas, and I decided to perform a short beach cleanup on Tannahill. 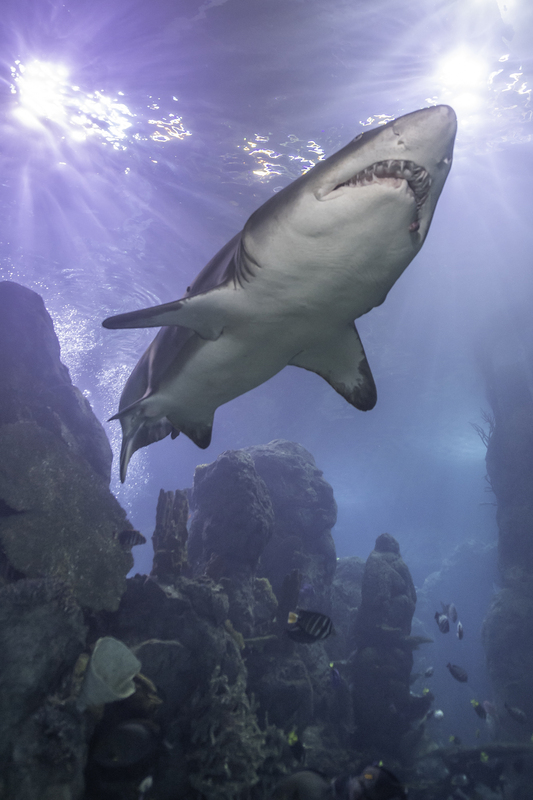 Suzy runs a non-profit organization called the Coastal Cleanup Corporation whose mission is to remove marine debris from Florida’s coast and educate the public. She volunteers with the turtle monitoring group at Biscayne and often sponsors beach cleanups throughout the year. During our quick 30-min beach cleanup, the four of us collected 10-12 full garbage bags of trash ranging from glass, buoys, and microplastic. After returning to headquarters and disposing of the trash, I was greeted by several individuals from the natural resource management department. 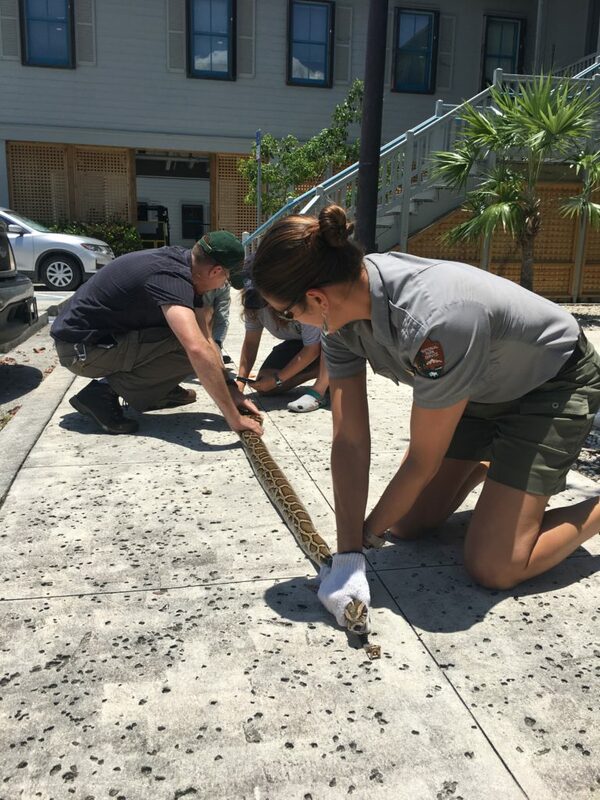 Apparently, while Herve and Austin were collecting samples for water quality analysis earlier that morning, they came across a 3 m Burmese python hanging off the buoy about 1.4 miles offshore. Vanessa, Elissa, and Herve worked together to restrain the invasive species and get an accurate length measurement. My fear of snakes definitely prevented me from jumping in to help wrangle the creature. 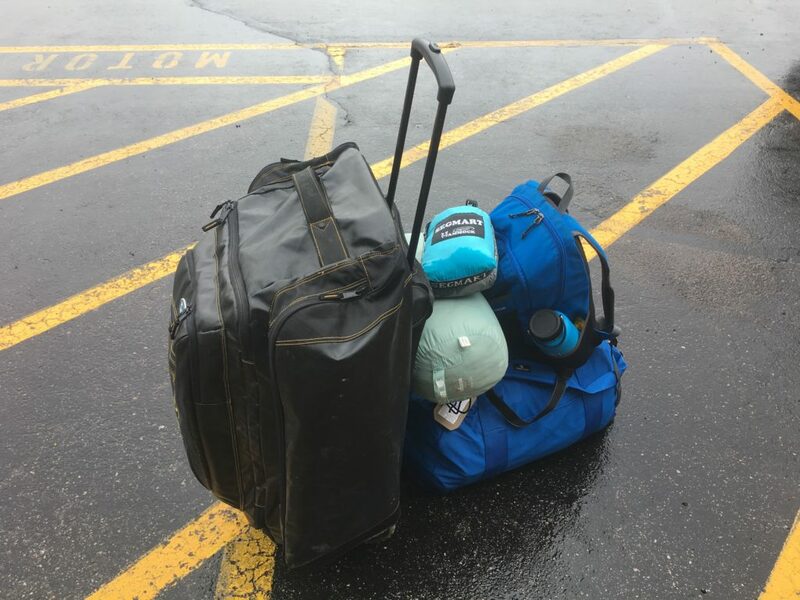 In the early hours of Saturday morning, Shelby and Herve drove me to the airport so I could continue my adventure. 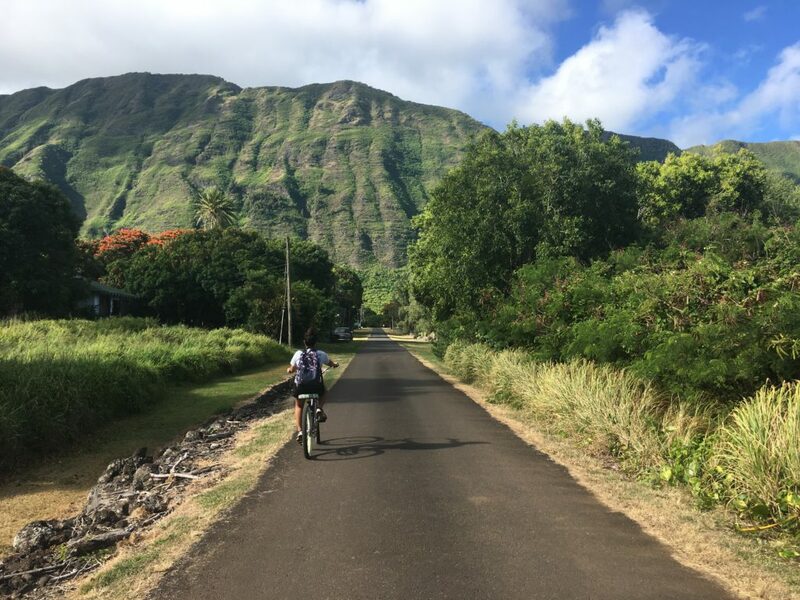 Three flights, lots of snacks, and almost a full day later, I would arrive in Honolulu, Oahu. 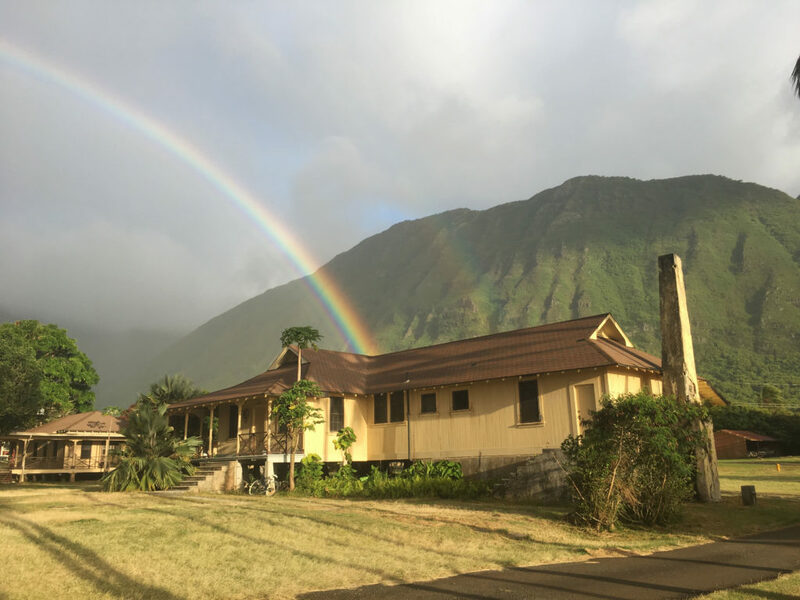 From there, I would take a small plane to my next destination, Kalaupapa National Historical Park. 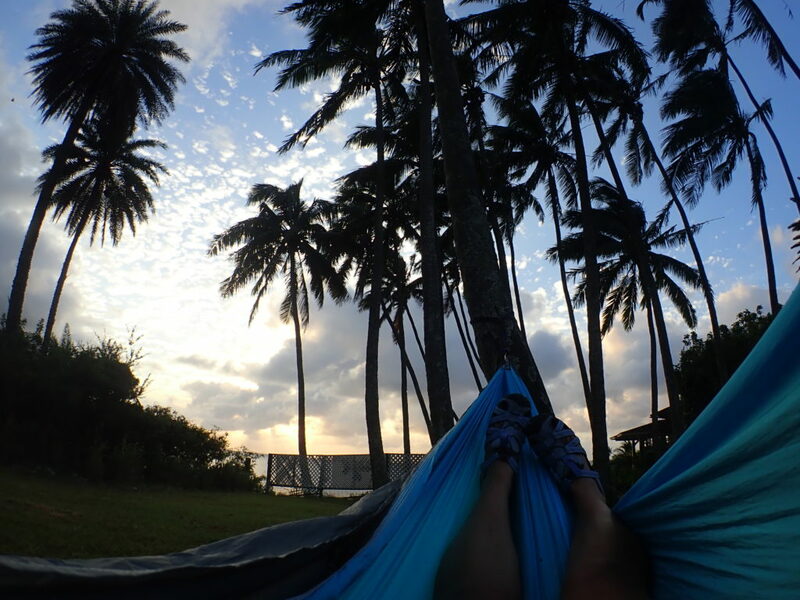 Thanks to all the great people who made Biscayne National Park feel like home for two weeks! 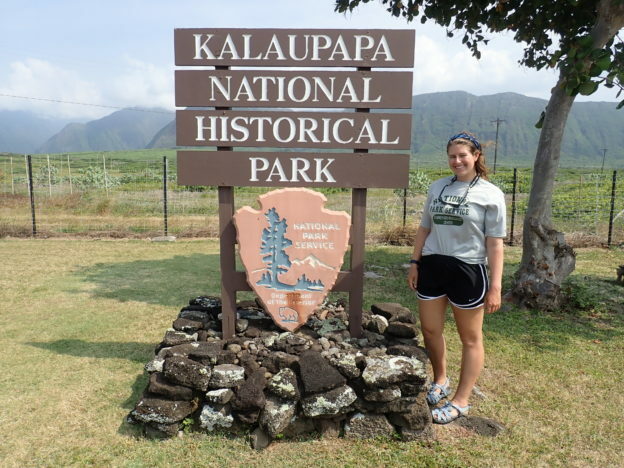 This entry was posted in 2018 National Park Service, Current Internships on July 12, 2018 by Shannon Brown. With Denver in my rearview mirror, I flew into LAX ready to visit my first park. Headquarter in Ventura, California, Channel Islands National Park (CHIS) is composed of five spectacular islands and their surrounding marine environment. Created in 1980, the main goal of this National Park was to protect the diverse terrestrial and marine ecosystem of the Channel Islands. After a shuttle ride along Highway 101, I was met by Joshua Sprague, a marine ecologist for CHIS. He graciously showed me to my accommodations for the evening, the Sea Ranger II. The 58-foot research vessel would be my home for the next six nights. On this fine Sunday evening, the boat remained docked behind the Visitors Center. With the crew not arriving until early Monday morning, I spent the evening exploring the harbor, walking the beach, and learning how to not bang my head into every overhang on the Sea Ranger II. 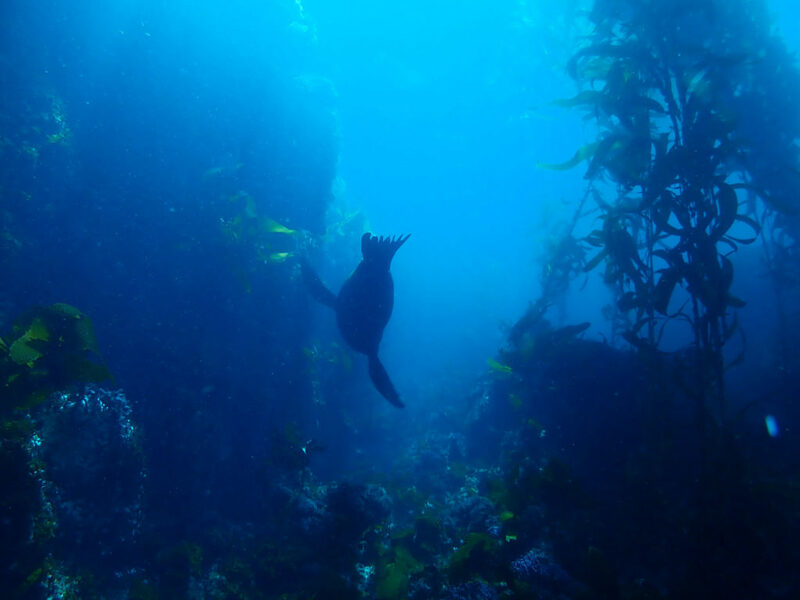 In the morning, the members of the long-term kelp forest monitoring project began trickling in. After organizing our gear and stocking the kitchen with a healthy supply of snacks, we bid farewell to our loud barking neighbors (i.e. the California sea lions) and headed towards our first site of the week along Santa Cruz Island’s coast. 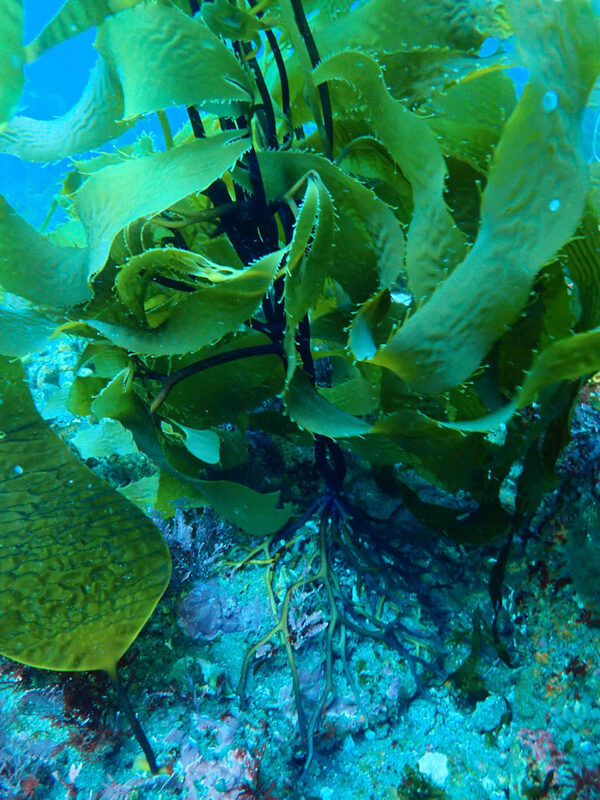 The Kelp Forest Monitoring (KFM) Program at CHIS is an extremely impressive, complex operation. 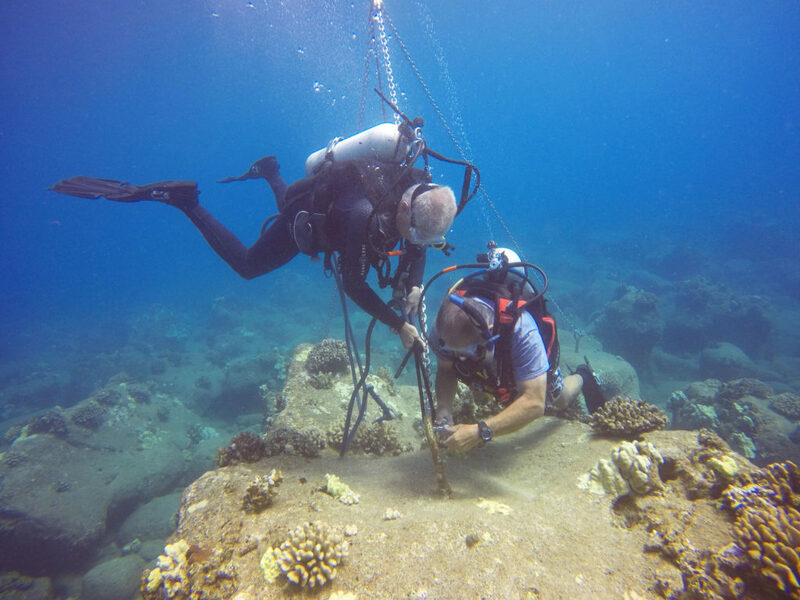 Starting in 1982, the program initially monitored 13 dive sites around the islands but as of 2005 has expanded to 33 sites. 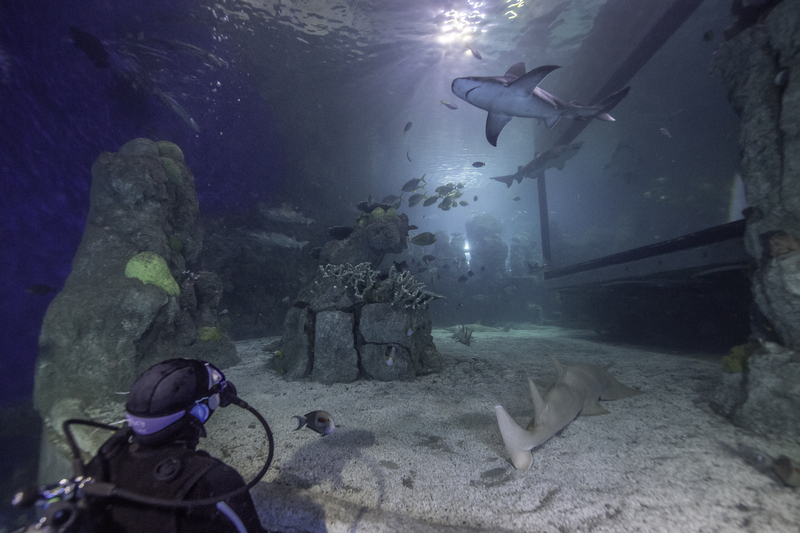 The marine ecosystem surrounding CHIS supports over 2000 species. 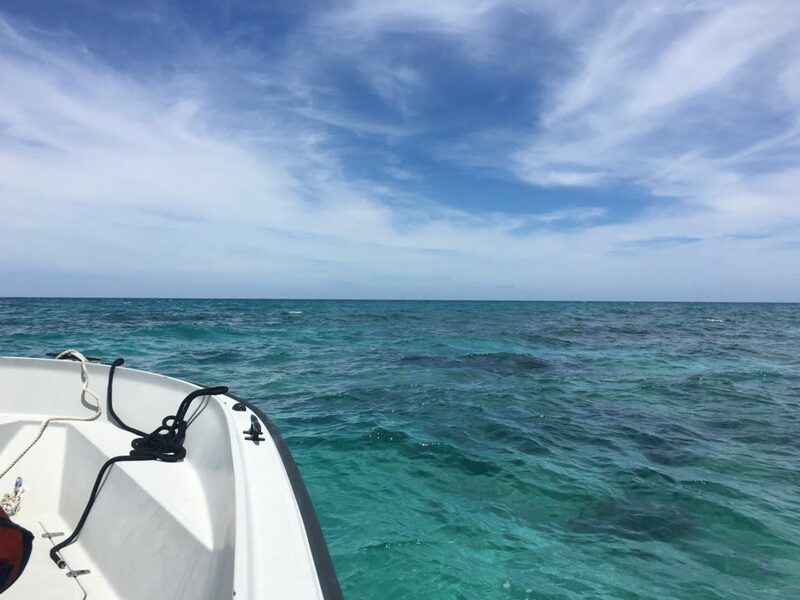 Each year from May to October, these 33 sites are surveyed to collect the size and abundance information of 120+ species of marine fauna (e.g. algae, invertebrates, and fish). 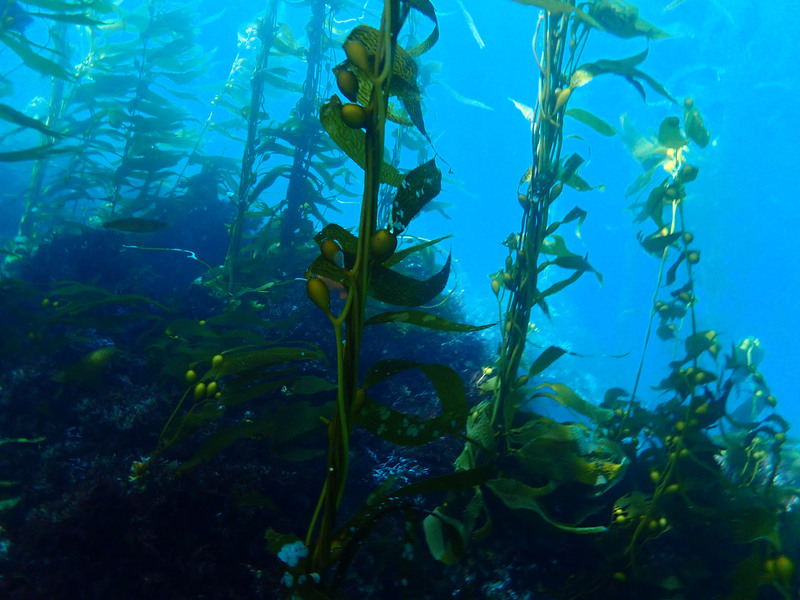 The data allows researchers to examine the kelp forest’s health and monitor ongoing changes to the environment. KFM was not created with the intent of answering questions. 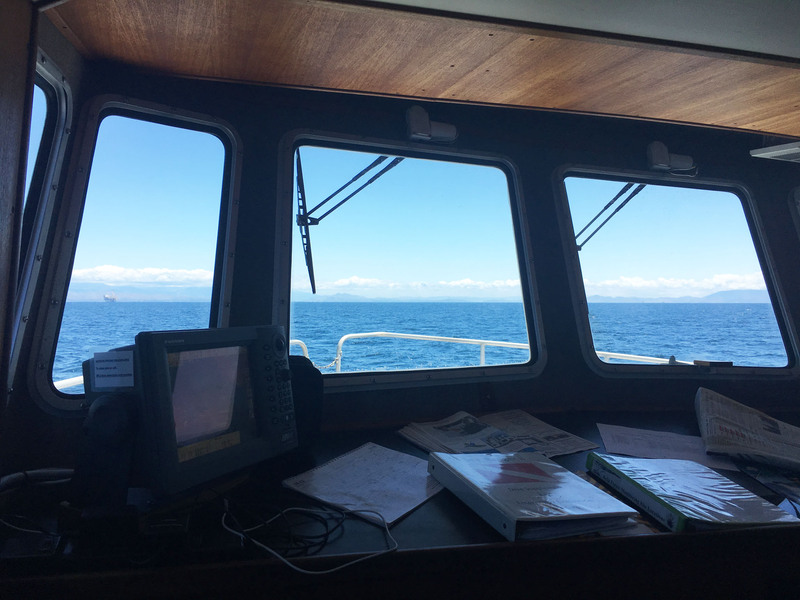 The data from the program is public record, and the identified baselines are used to help establish marine protection protocol. 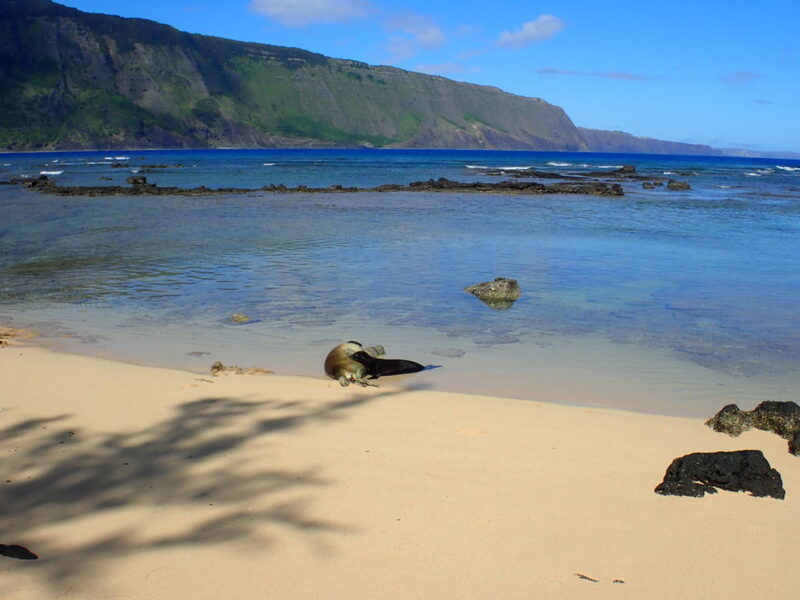 Currently, 20% of CHIS waters are considered state marine protected areas. 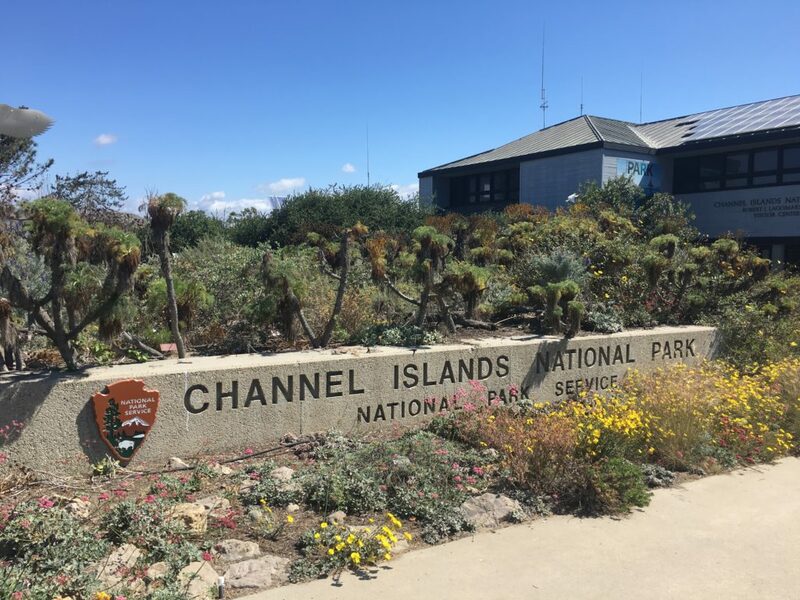 In addition to the KFM program, Channel Islands National Park supports a wide variety of other programs that focus on the overall health of the park resources (e.g. intertidal, pinniped, bird, and invasive plant monitoring). 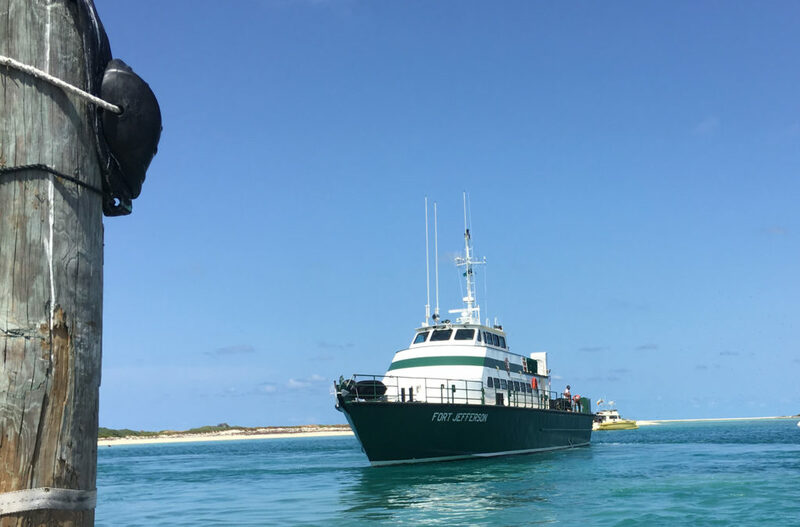 With a rougher Pacific Ocean passage behind us, we arrive at our site for the day, Pedro Reef– Santa Cruz Island. 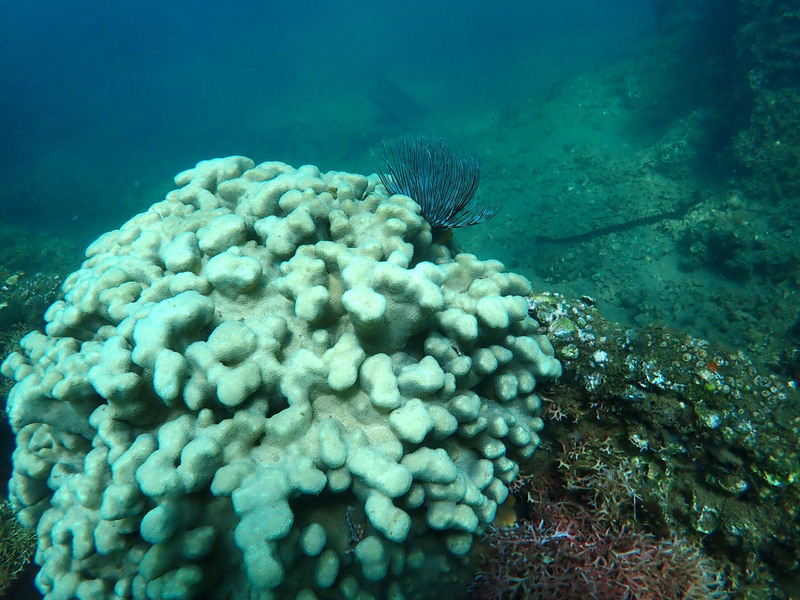 Not located within an MPA, the dive site is barren and uninhabitable. The lack of kelp at this site can be attributed to overfishing. 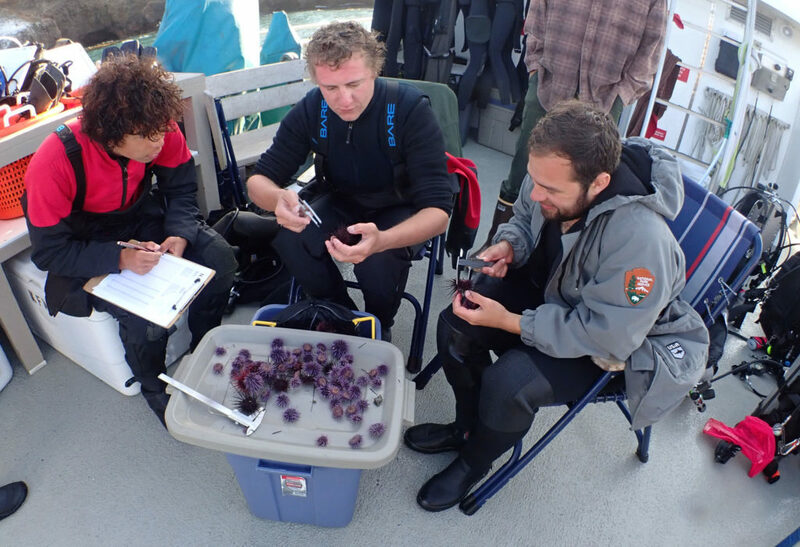 When predators of sea urchins are overfished, their population size increases. 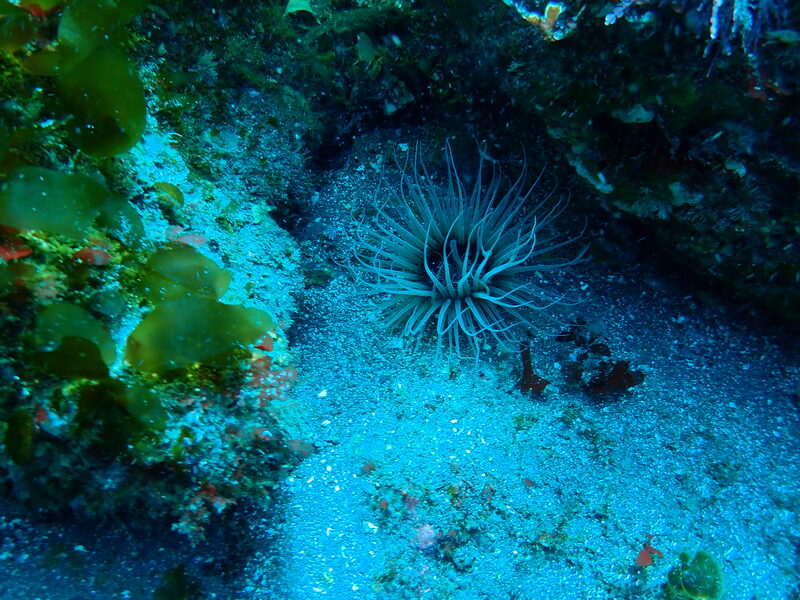 As herbivores, urchins consume the kelp that provides food and habitat to other marine organisms. Having just completed my blue card certification in Colorado, I still had to finish the open water portion. 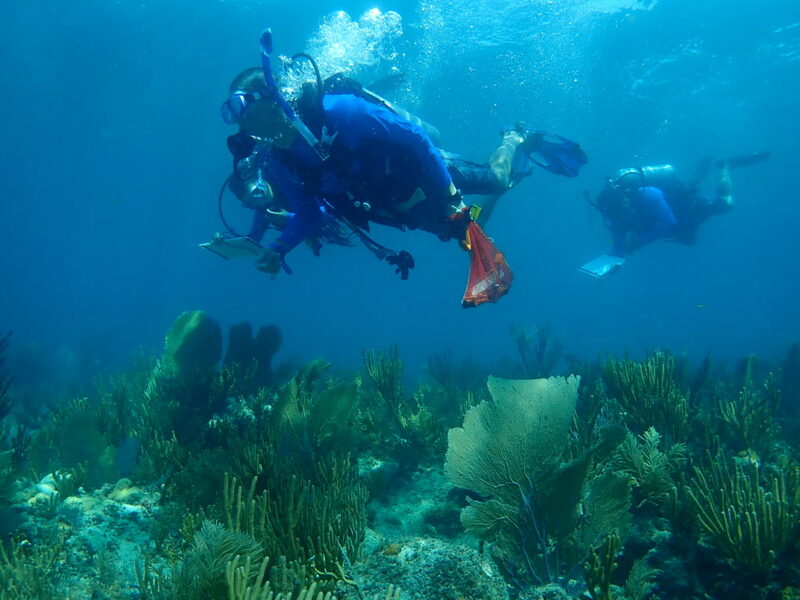 For this, David Kushner, the Regional Dive Officer and head of the KFM program, ran me through several underwater skills. 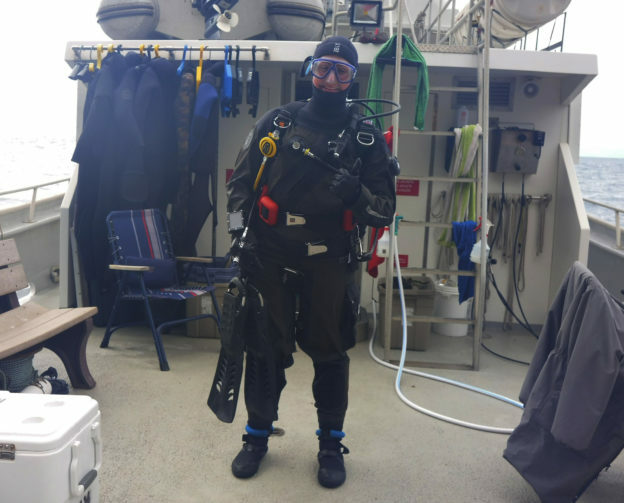 While the low visibility had me a little disoriented at first, I am proud of how I handled my first open water dive in a drysuit and my first dive in the Pacific Ocean. Getting out of the water was another feat entirely. With the waves rolling and about 20 lbs. resting on my hips, let’s just say I rolled onto the boat platform rather than gracefully glided. Definitely not a picture worthy exit. As part of my exam, I was also supposed to perform a surface swim. 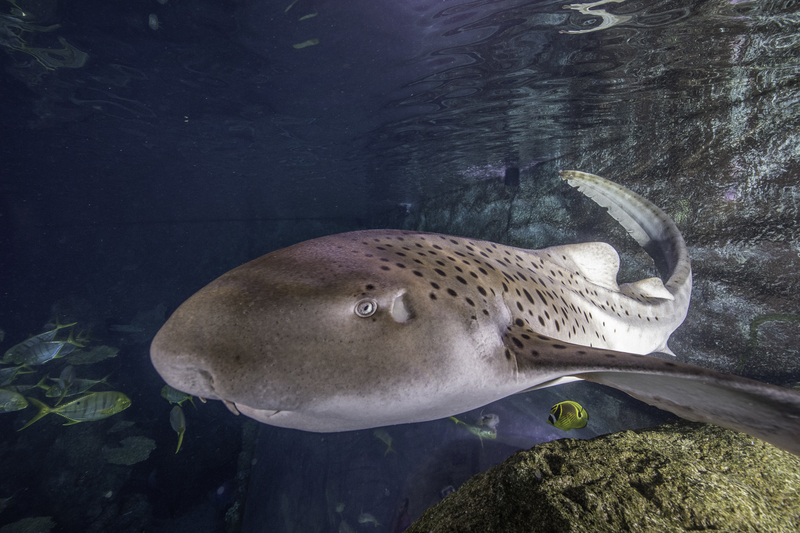 However, due to a recent great white shark sighting, it was decided that me swimming across the surface in a brown drysuit might appear too seal-like. 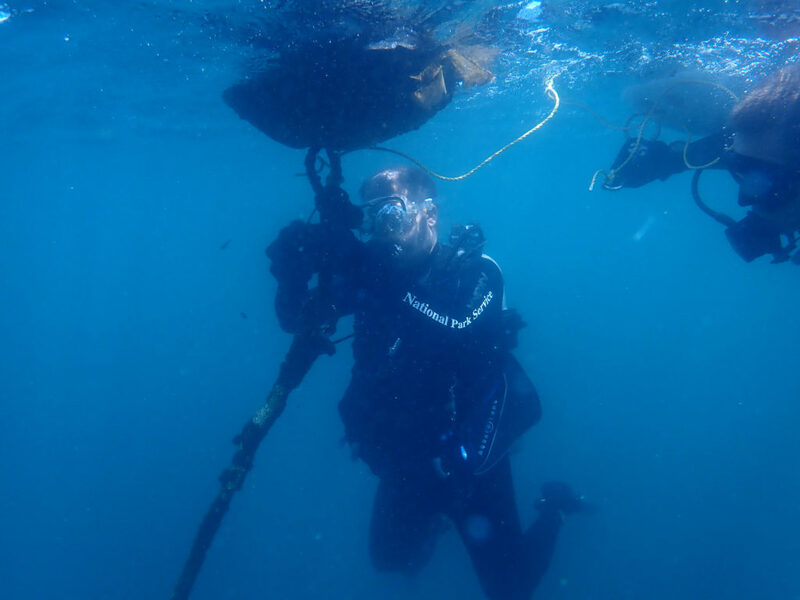 After finishing my dive and realizing that my drysuit didn’t actually manage to keep me dry, I spent the remainder of the day assisting topside as the KFM crew finished collecting data. 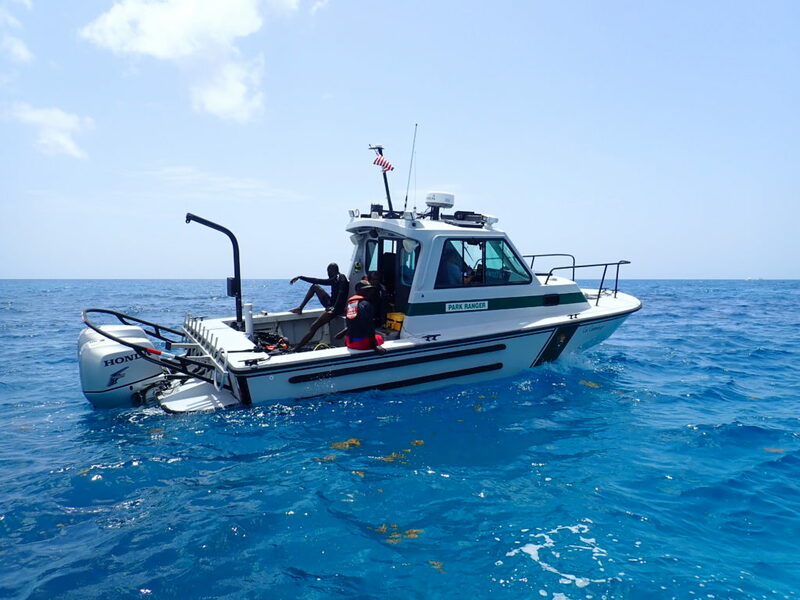 From band transects to roving diver fish counts, a multitude of different surveys are performed at each site to observe the fish, invertebrate, and algal communities. 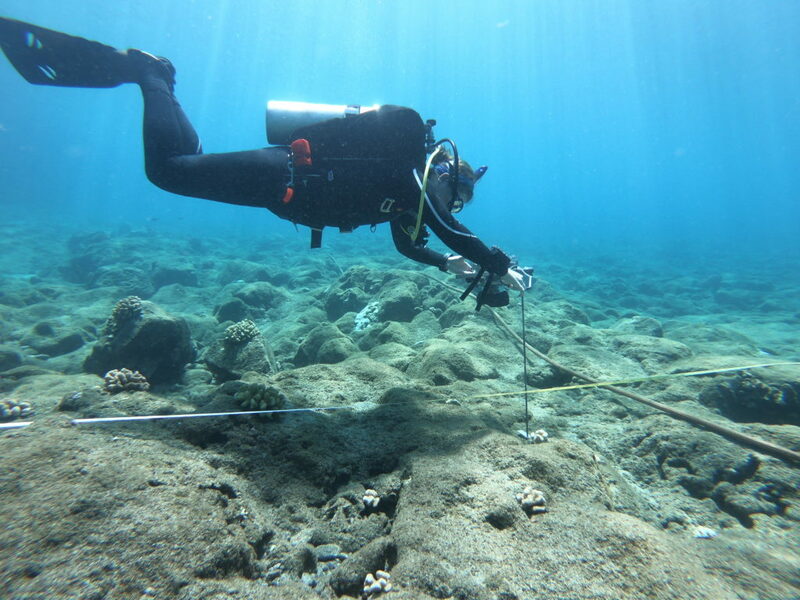 Water temperature is recorded, and a video transect of each site is captured for historical reasons. The imagery allows the KFM members to visually look back on the 33 sites visited each year during their survey season. One of the most impressive survey protocols used by the KFM program is Random Point Contacts (RPC). 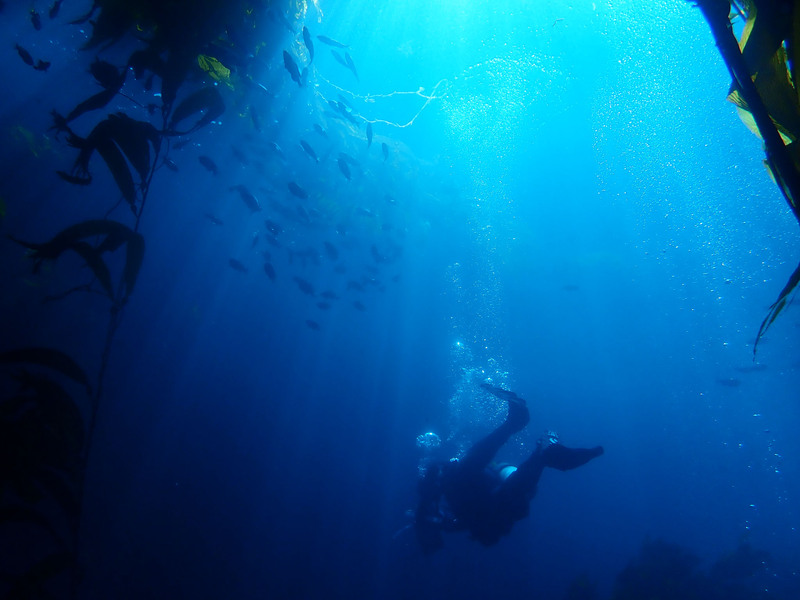 In a full-face mask attached to surface supplied air, a diver travels along the transect and at random points calls out the organism covering the substratum. 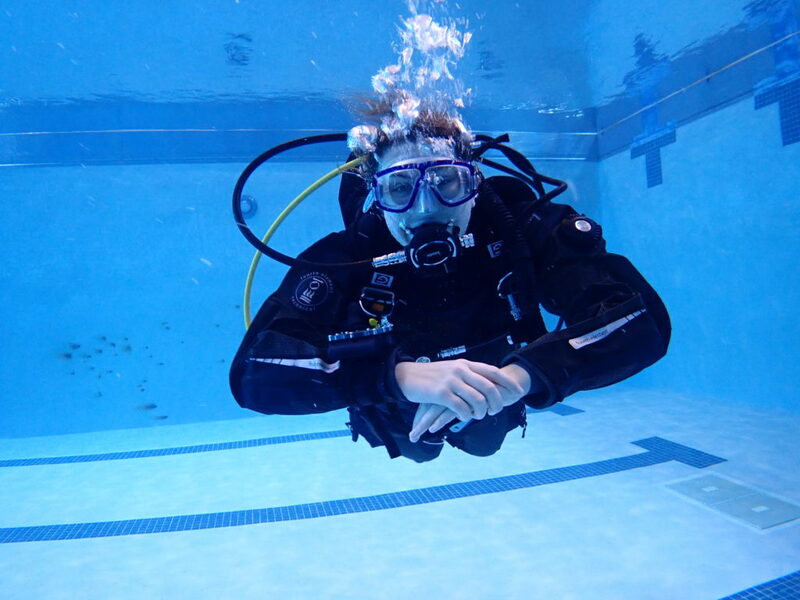 The full-face mask allows the diver to communicate with the surface support person and the need for a slate is eliminated. Such a technique, allows a massive subset of data to be collected in a shorter amount of time. In the evening, Captain Keith Duran anchored the Sea Ranger II at Smuggler’s Cove. We ate a lovely dinner, and then I watched as the crew checked and consolidated the data collected at Pedro Reef. 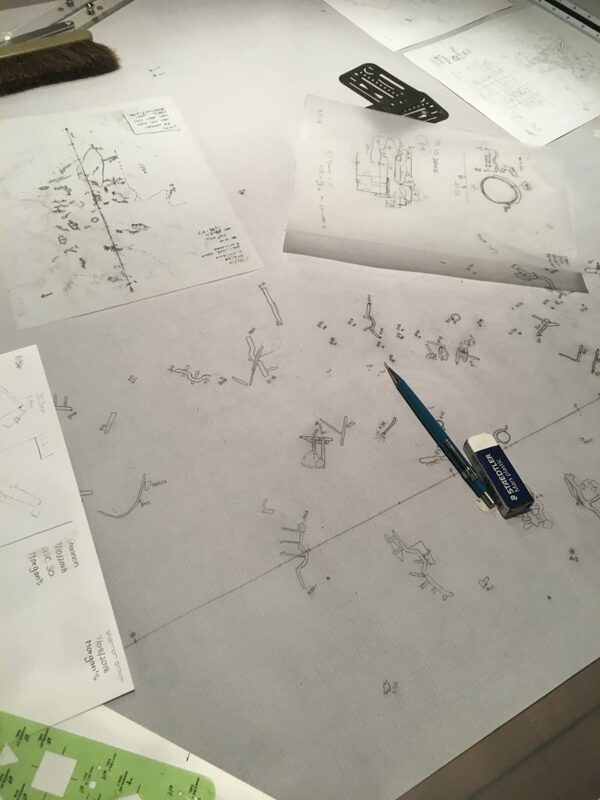 Each evening of the cruise, the team spent 1-2 hours discussing the site in detail. They recorded any anomalies and worked together to create a species list for the site (ranking species based on their prevalence). 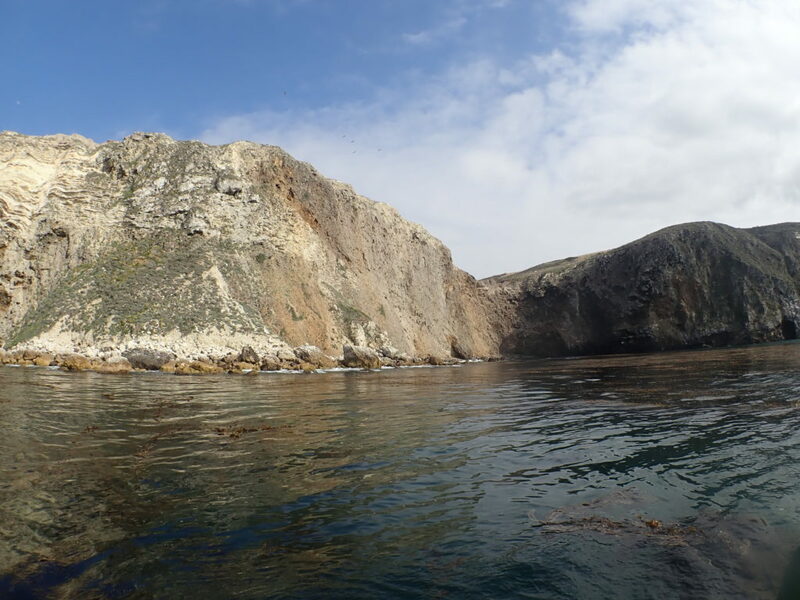 On Tuesday morning, with the anchor pulled at 7:30 am, Captain Keith drove us to our second dive site of the week, Landing Cove – Anacapa Island. 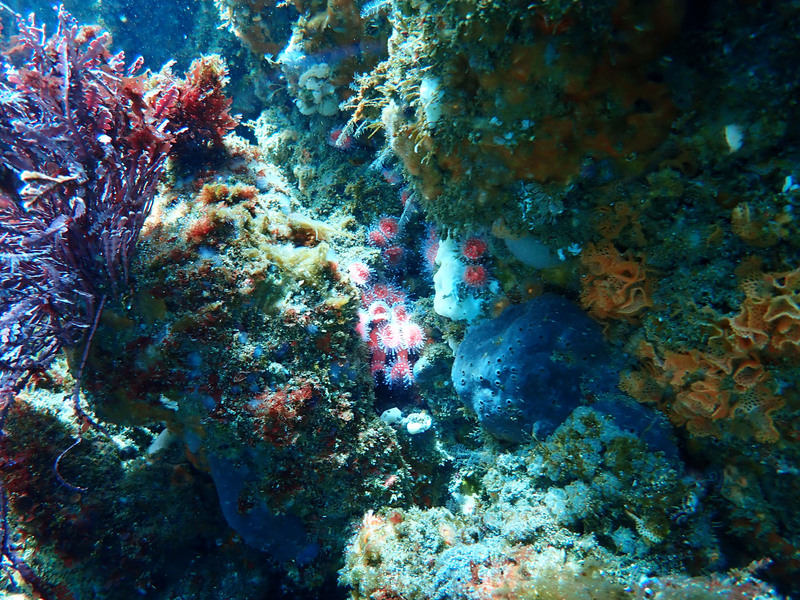 Tuesday’s dive site was located in a marine reserve established in 1978, the oldest in California. Diving this site provided a unique contrast to the urchin-dominated Pedro Reef where we spent the previous day. Landing Cove also gave me my first opportunity to observe the diverse kelp forest habitat in its full glory. With a leaking drysuit, I was fortunate enough to borrow Cullen’s extra 7mm. The suit definitely kept me warm and the camouflage pattern was a great fashion statement. On my first dive, I accompanied Merrill McCauley, a park ranger, as he completed a macro survey. 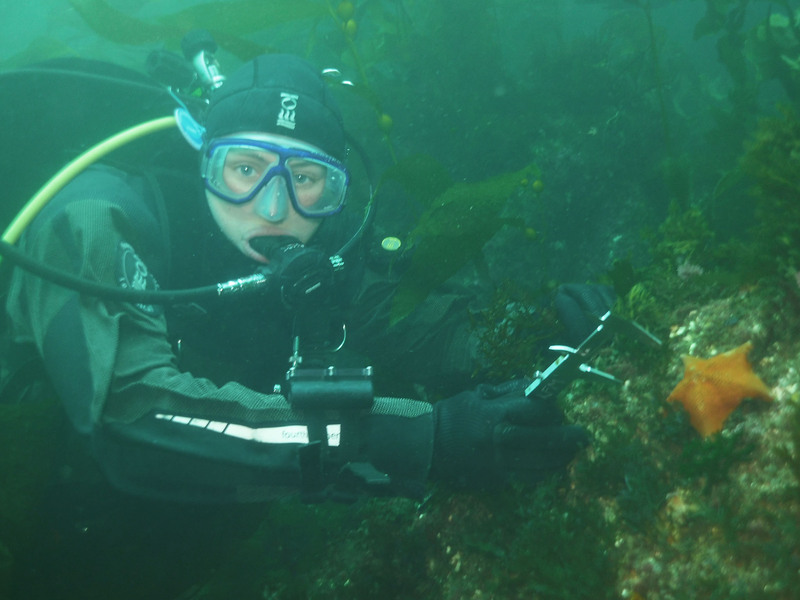 Macro surveys involve counting stipes on 100 giant kelp (Macrocystis pyrifera) along the transect line. During the second dive, I followed Luis Hernandez and Merrill through the towering kelp as they performed 5-m transects. 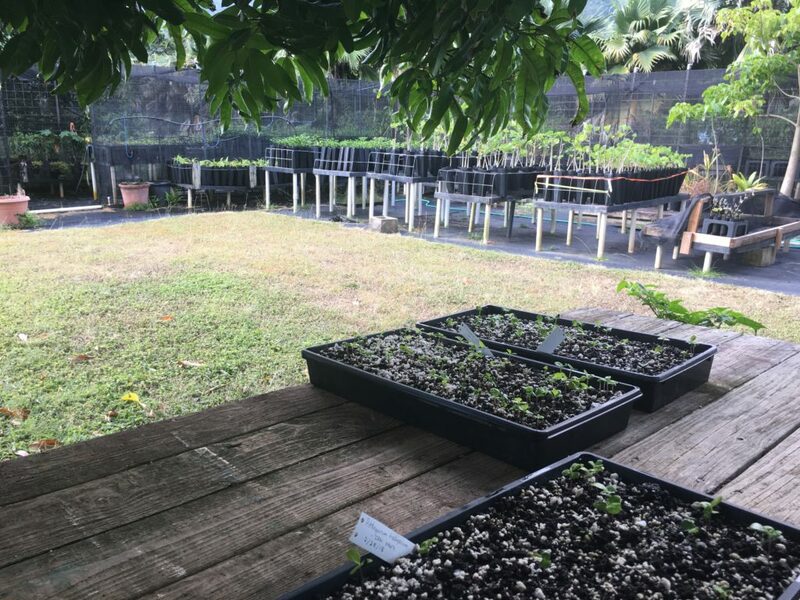 Since I had no experience identifying the fauna at CHIS, by the second day, I was still too green to contribute to official data collection. Topside, I assisted Kenan, Luis, and Cullen as they measured 100+ sea urchins brought to the surface. Safely returned to their homes on the subsequent dive, these sea urchin measurements allowed the team to understand the population dynamics of the three common sea urchin species found in CHIS: purple sea urchins (Strongylocentrotus purpuratus), red sea urchins (Strongylocentrotus franciscanus), and white sea urchins (Lytechinus anamesus). 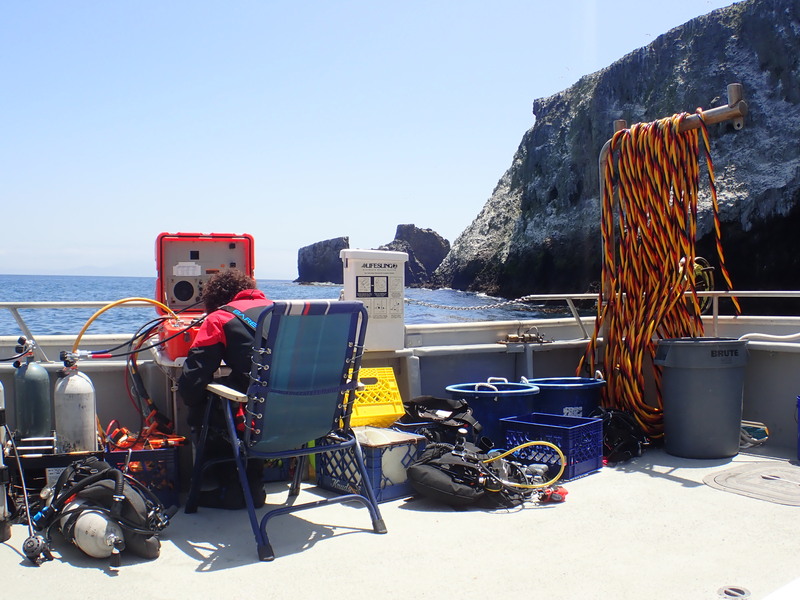 Following a productive day of diving, the seasonal interns and I explored Anacapa Island. This small desolate island becomes a dense, western gull breeding ground from May to July. 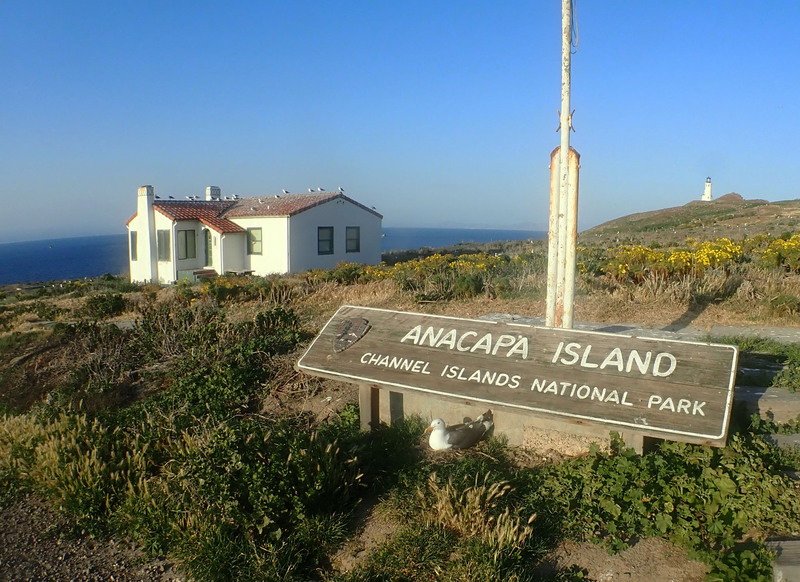 Anacapa supports the largest protected breeding colony of western gulls in the world with over 10,000 individuals. 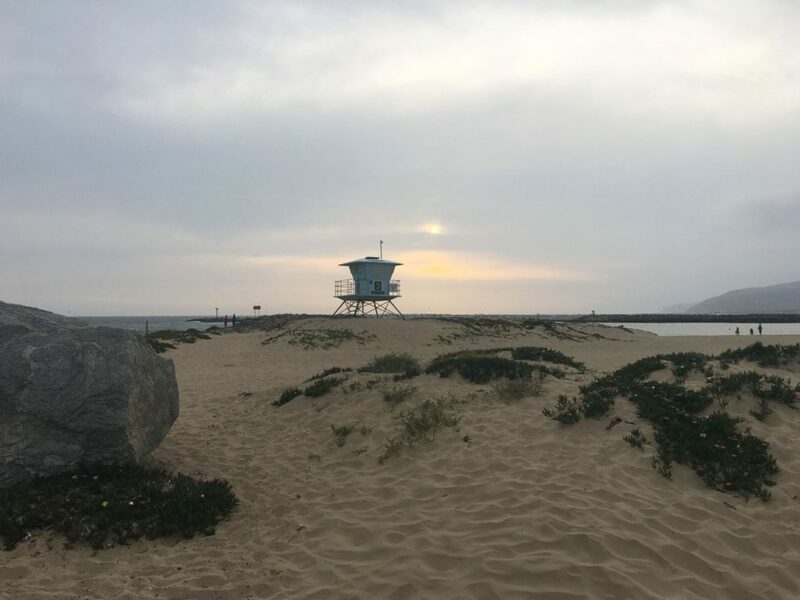 While we enjoyed the amazing views and the baby seagulls, Erin Jaco, unfortunately, learned the hard way that these birds sometimes use their poop as a foul weapon. 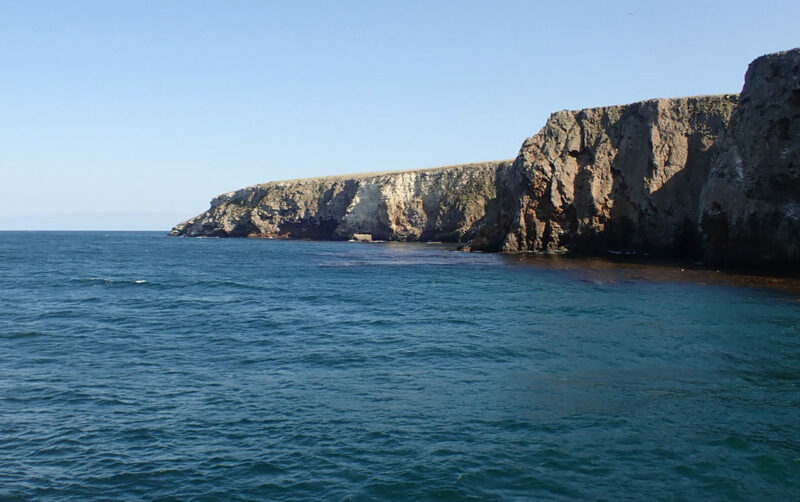 On Wednesday morning we anchored at Cavern Point – Santa Cruz Island. Located in an MPA established in 2003, this site gave me the opportunity to contribute to the data set for the first time. Luckily, the previous evening, Cullen was kind enough to help me patch my drysuit. And thankfully, his repair was successful. 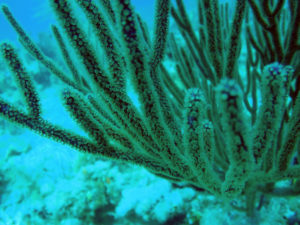 On my first dive, Merrill and I performed macro counts and measured gorgonians. For the second dive, Captain Keith and I were given the opportunity to explore. 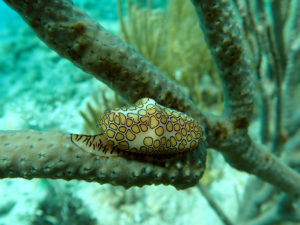 I became enticed by the spectacular invertebrate community at the site. 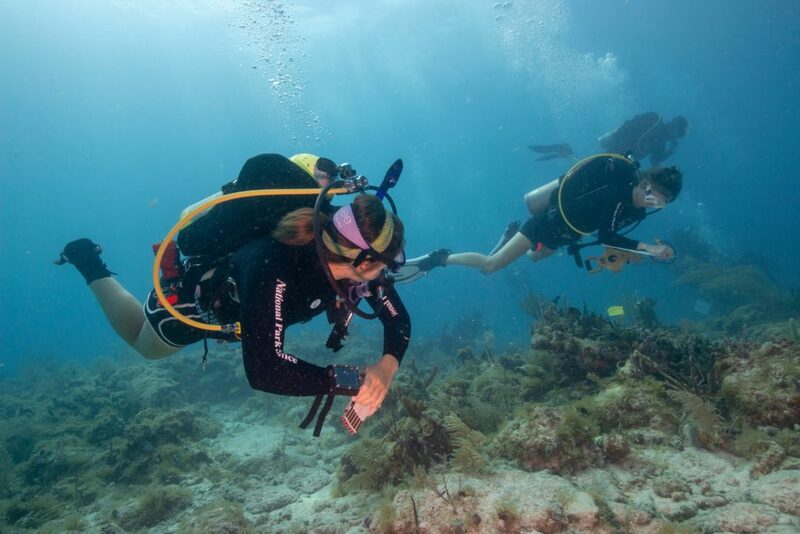 From the sea cucumbers to tunicates, these are creatures that you don’t notice when you are focused on counting Macrocystis stipes or searching for the next gorgonian to measure. Keith and I also saw several massive California sheephead (Semicossyphus pulcher). 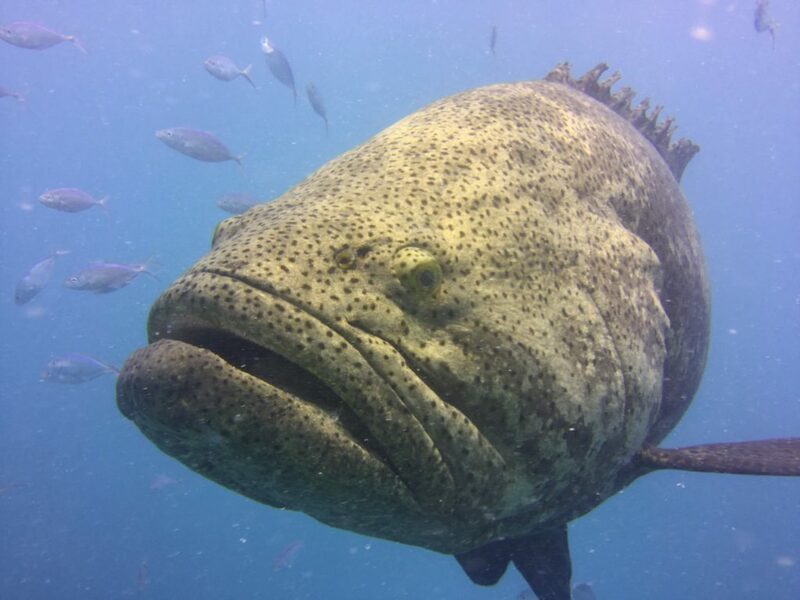 Overfished in some regions of the park, the KFM program has found that targeted marine fish, such as sheephead, have larger average lengths within MPAs. And bigger fish means there are more eggs. 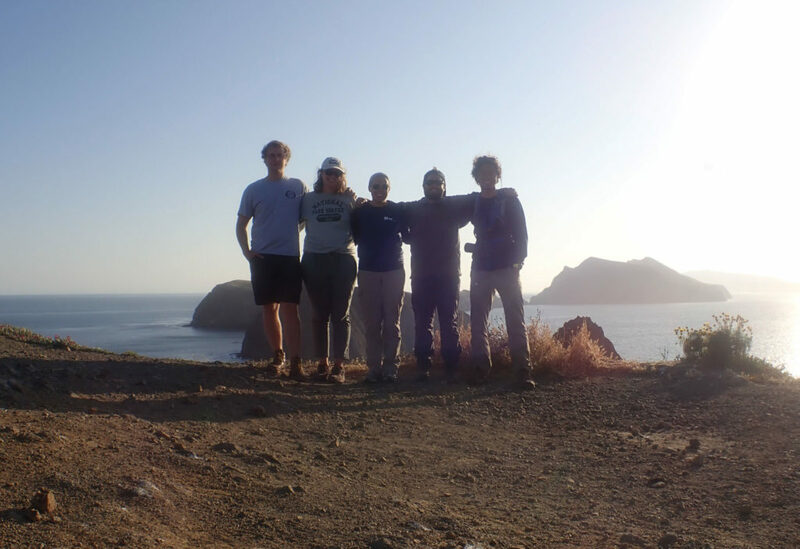 Graced with a few more hours of daylight, the group explored Santa Cruz Island. The largest of the Channel Islands is split between the National Park (24%) and The Nature Conservancy (76%). Docking at Scorpion Anchorage, we hiked 3.5 miles (roundtrip) to a vantage point of our day’s dive site. 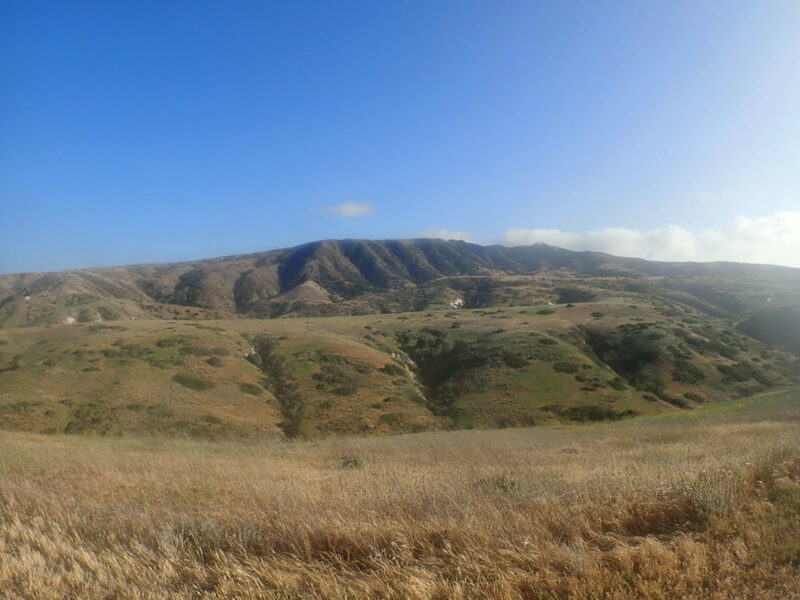 Compared to Anacapa, this island was covered in green vegetation and rolling hills. While on the island, island foxes, a unique subspecies, ran along the campsite trails. 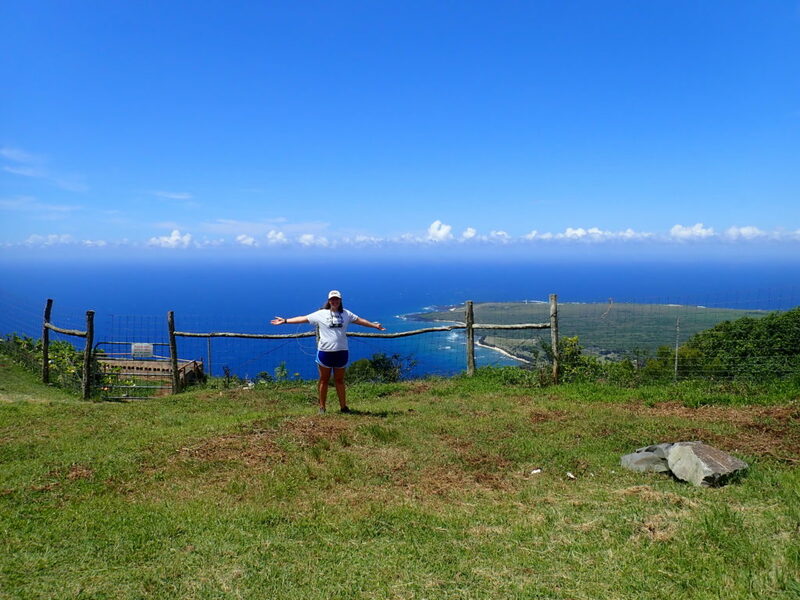 Living on six of the eight islands, these foxes are 1/3 smaller than their mainland ancestor. Located in a marine conservation area established in 2003, Thursday’s dive site: Keyhole – Anacapa Island, is closed to all fishing except recreational/commercial lobster and pelagic fish. Unique to this data collection day, Merrill and I spend one of our three dives measuring the bat stars (Patiria miniata) that riddled the site along the transect line. Since Friday marked the end of the KFM trip, the team did not have sufficient time to visit another survey site. 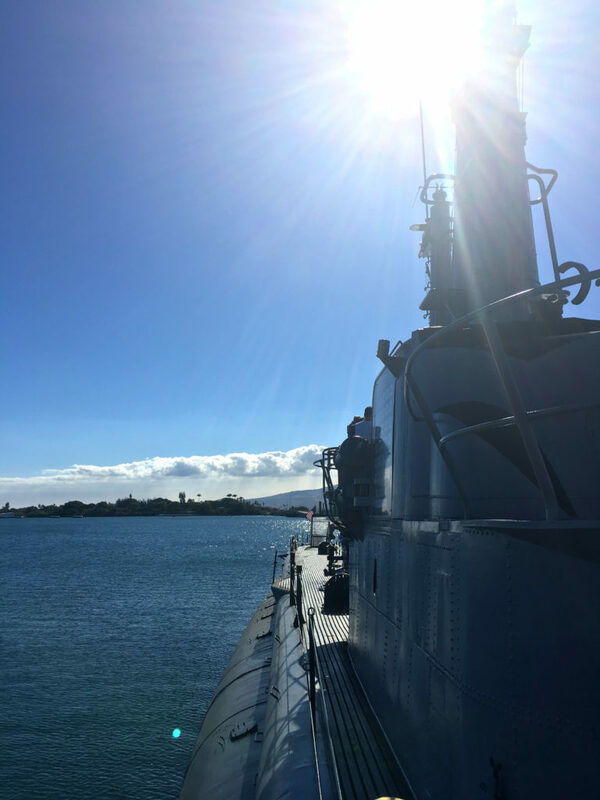 Instead, we used the morning to complete a 90-foot dive at Yellowbanks – Santa Cruz. Open to all fishing, this kelp-less landscape is dominated by brittle stars and enormous sea urchins. 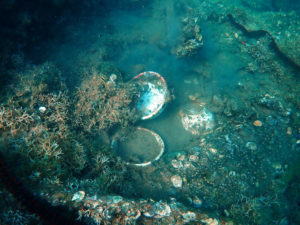 Previously a home to abalone, the only evidence of this species was a large shell trapped in a discarded lobster trap entangled on the ocean floor. Upon completing the dive, we were accompanied by common dolphins as we traveled back to Ventura. By the end of the KFM trip, I had learned a lot. My buoyancy with a drysuit had drastically improved, and my entry/exit from the water was nowhere near as clumsy as my first day. When I arrived, I have to admit I was intimidated by the amazing, dedicated divers of the KFM program. 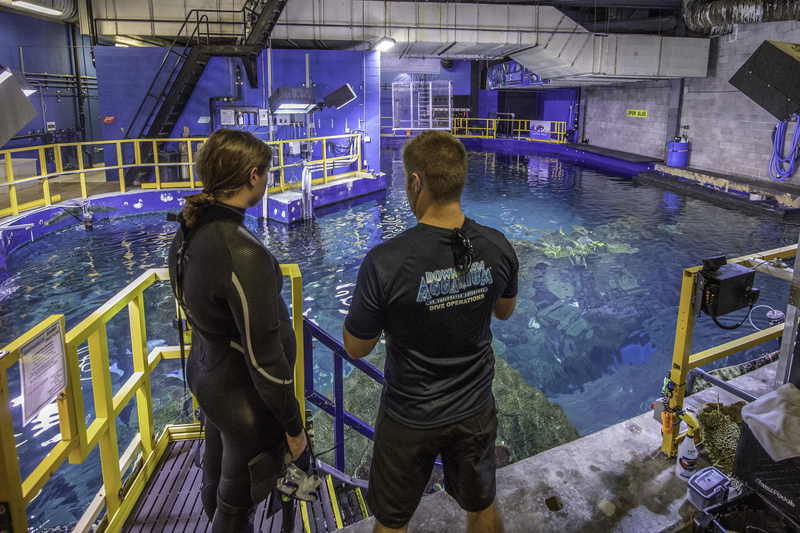 To collect data vital to the park’s records, they performed long dives several times a day often in limited visibility and current. 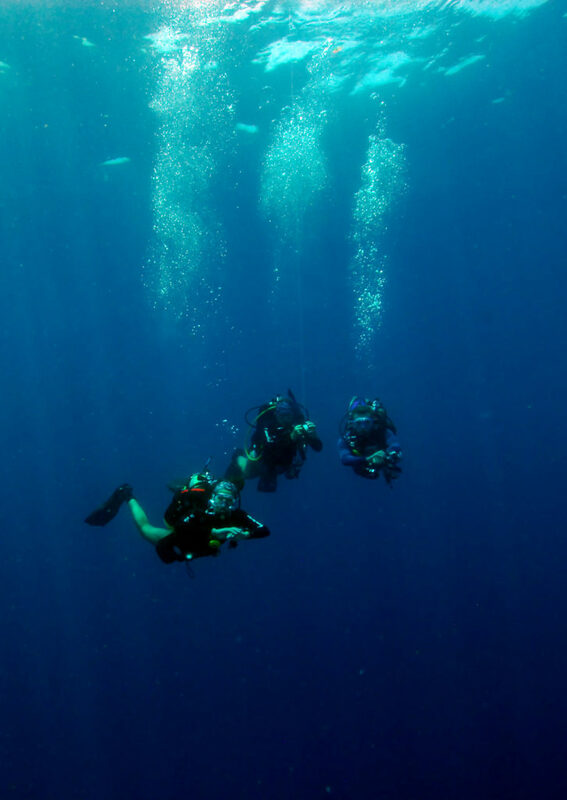 I learned a lot from them and enjoyed getting the opportunity to dive all week in this lovely park. 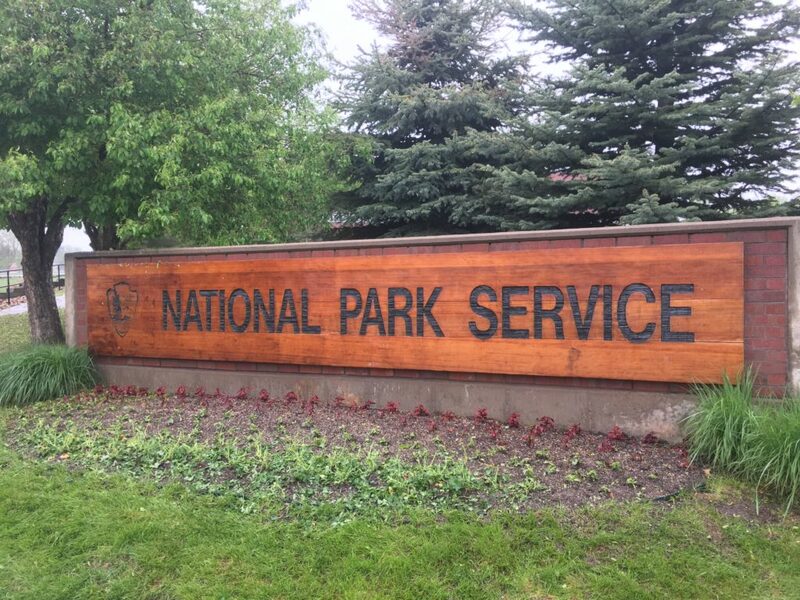 I even had a fantastic drysuit hand tan to show for my first national park of the summer! Like my first night in Ventura, my final night was spent on the docked Sea Ranger II surrounded by a chorus of barking sea lions. After almost missing my shuttle back to LAX, I arrived hours before my flight and got the chance to catch up with a close, college friend, Chloe Von Helmolt. 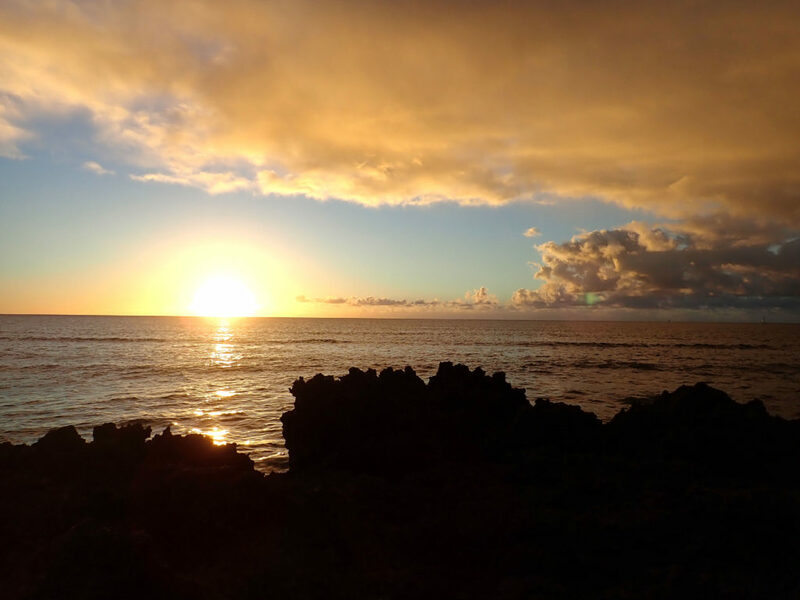 In the evening, I headed back to the airport in search of warmer waters. Biscayne National Park about an hour south of Miami, Florida would be my next destination. 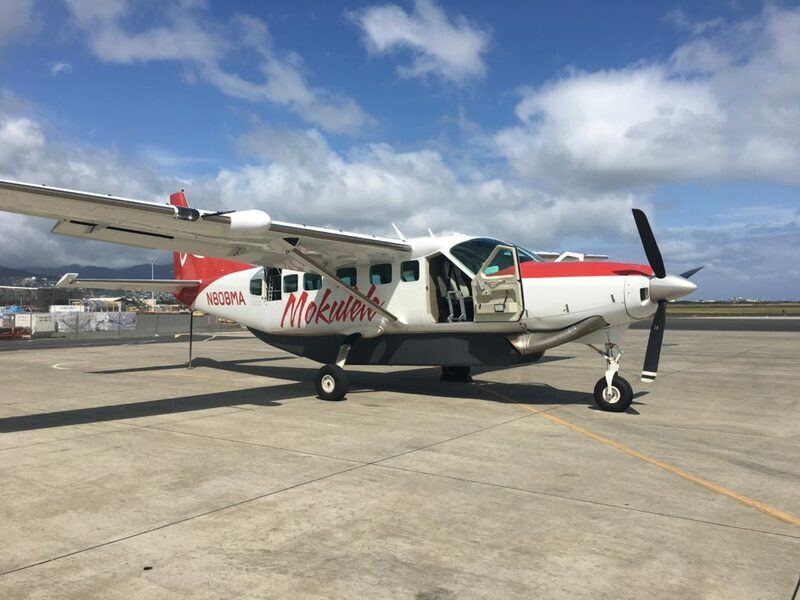 While I enjoyed kelp forest diving, tropical waters were calling my name as I boarded my red-eye in search of the sunshine state. 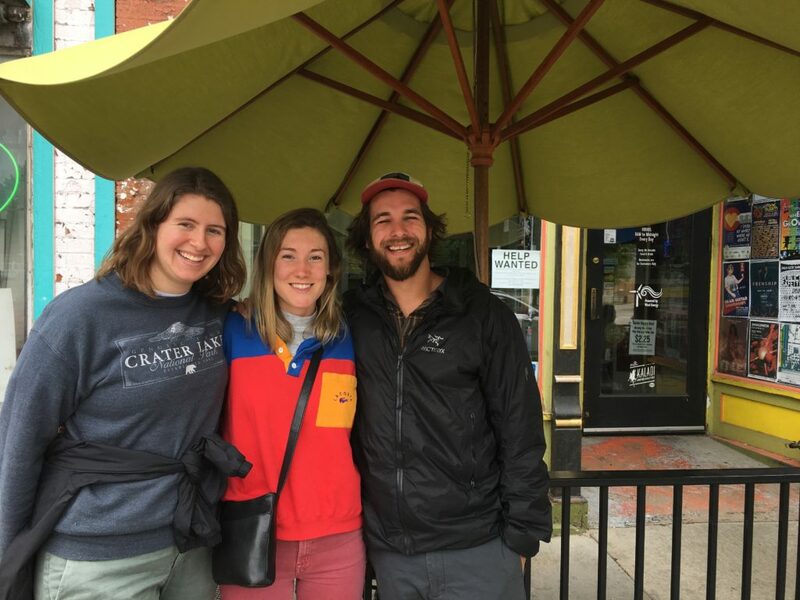 Thanks again to the amazing Kelp Forest Monitoring team! 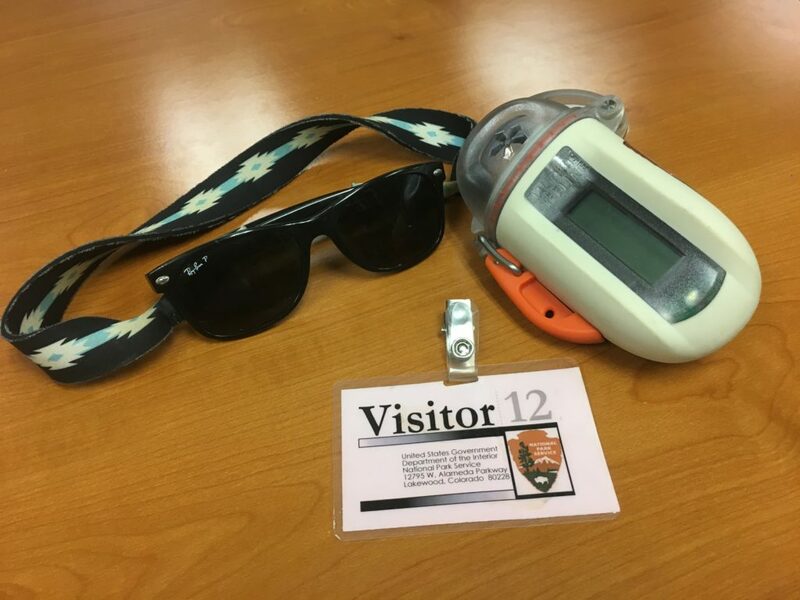 This entry was posted in 2018 National Park Service, Current Internships on June 18, 2018 by Shannon Brown.